As those of you who follow me on twitter might know, this blog’s first anniversary passed last week. I accidentally missed it. Food Truck Nerd reminded me on Monday that it was coming up, so I looked up what day it was in the archives. I thought it was the 5th, but I apparently missed the fact that I had so many posts in July of 2011 that there was more than one page of them! The first post was actually written on the 3rd, and I didn’t realize that until the 5th, naturally. Ugh. By the time I realized that, I was so disappointed in myself I couldn’t bring myself to write for awhile, but now I’ve sucked it up and am back. This was mostly a result of another nostalgic moment for me yesterday, the last Edgewood Eats indefinitely. Before I write about that, though, let’s catch up on some of the truckin’ I’ve done in the couple weeks since my last post. 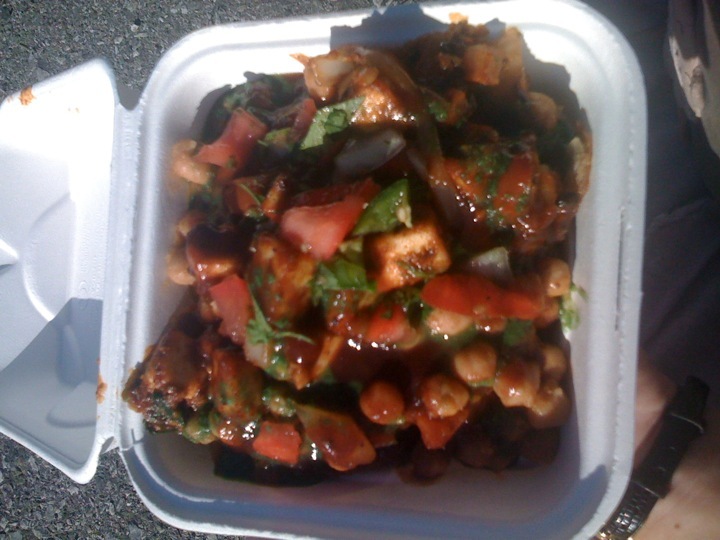 I caught up with Baba Kabob for the second time during one of their lunch runs. 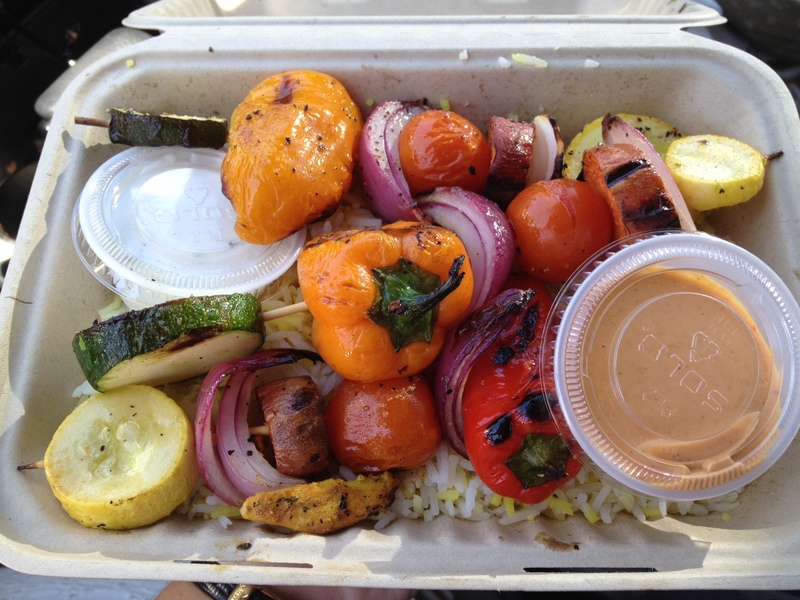 I had been craving the veggie kabobs I had the last time I tried their truck. This time they were serving them over rice I hadn’t had yet, and it was the perfect combination. 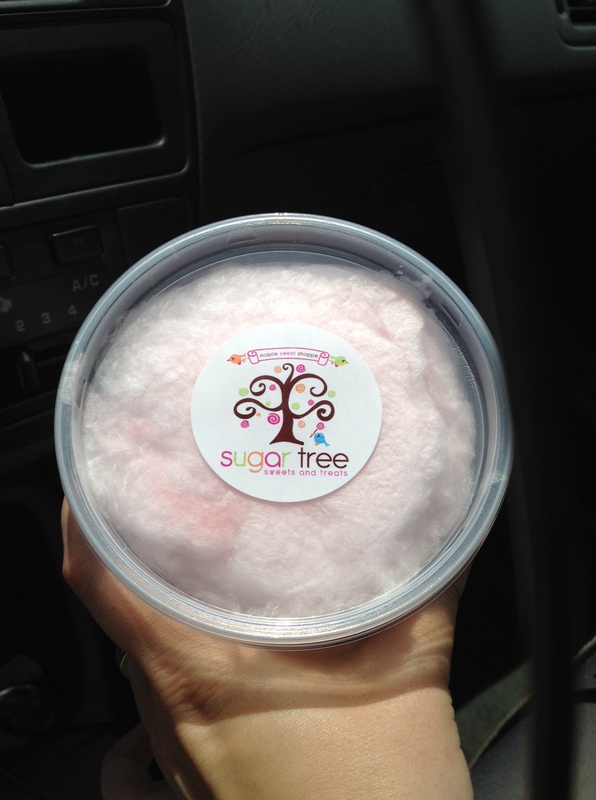 I also sought out Sugar Tree for a second taste on a lunch run. This time I even got to meet the owners and chat with them! I was sure to grab two new treats. 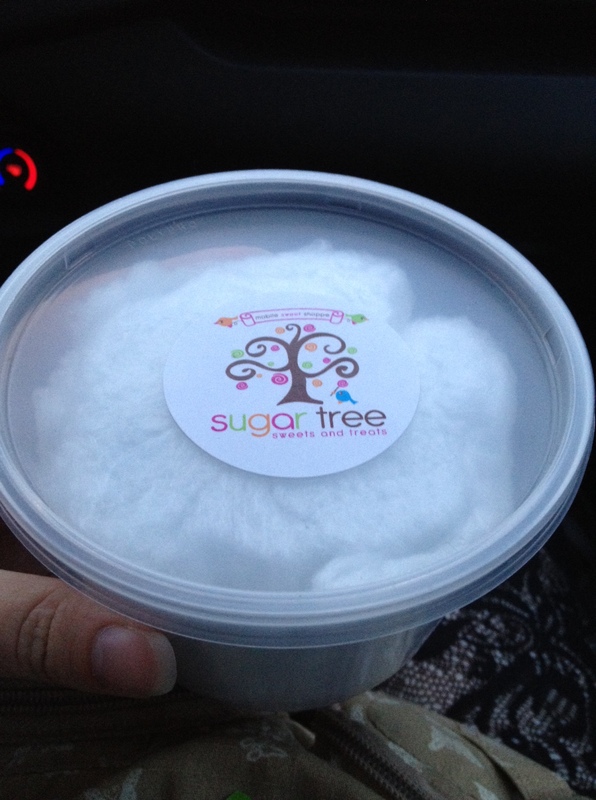 I had to have more of the organic cotton candy, but this time I got a new flavor. 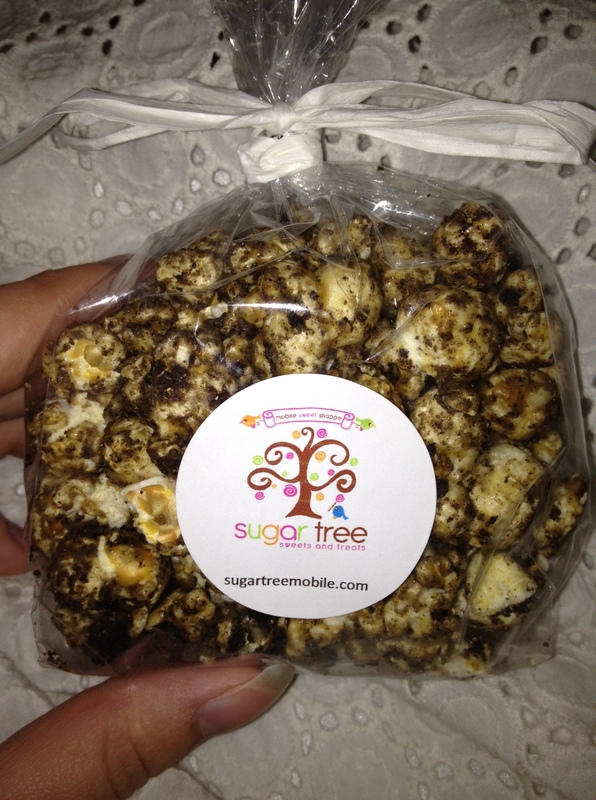 I also picked up some cookies and cream popcorn, which one of the owners said had been referred to as “crack” before. I wouldn’t say that description is too far off; when I ate it I easily ate it all in one sitting. 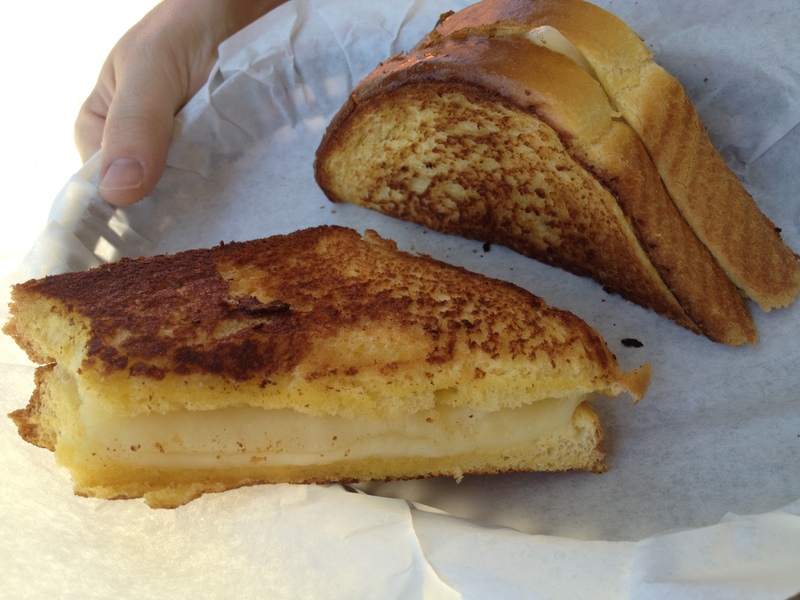 On the Fourth of July, Kyle and I headed to the Rose, White, and Blue parade, but we bypassed the Moveable Feast lineup to high-tail it to a new truck we hadn’t tried before, Grilled Cheese Bandits. When we found them we were greeted by a young lady handing out paper menus, which I thought was a nice touch to get the word out and prevent the usual crowding around the menu at a truck. We looked at the options, made our choices, and went up to the truck to place our orders. Kyle decided on the Dillinger, which consisted of jack cheese and garlic on texas toast. I tried a bite, and it was a nice spin on a classic grilled cheese. 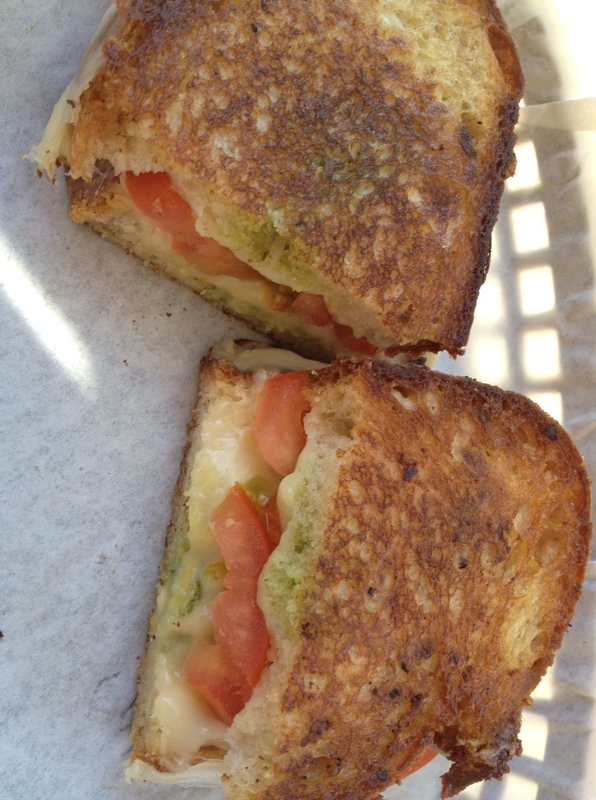 I went with the Giuliano which was similar to a caprese style grilled cheese. It was smaller, but had much more flavor. I also liked how they served their sandwiches in baskets that you could then return to them after you finished; much better for the environment! My final food truck visit before I get into Edgewood Eats took place at yet another lunch run. (Do you see a pattern here?) I was in Palo Alto for a doctor appointment and happened to see on my phone that Manna was going to be at Sequoia hospital in Redwood City. I had only tried them once before and thought the roll I got was so awesome I couldn’t wait to have it again. 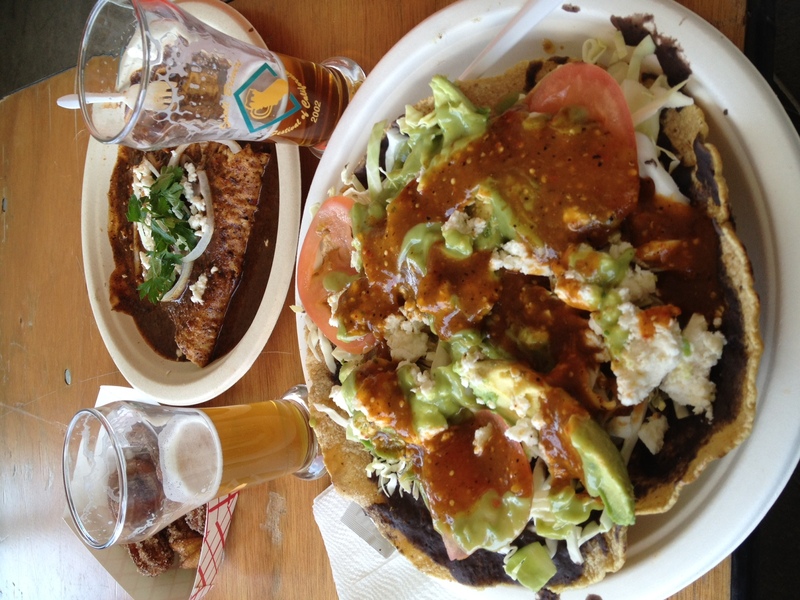 They don’t really travel down to the south bay, so I didn’t mind going out of my way to try them again. 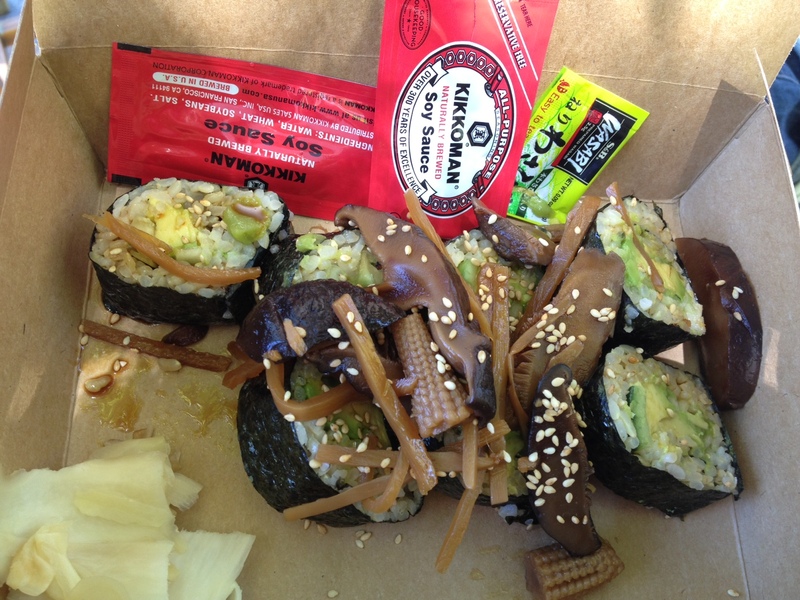 I usually try to get something new when I go to a truck for the second time, but I couldn’t not get the best veg sushi I’d had again! 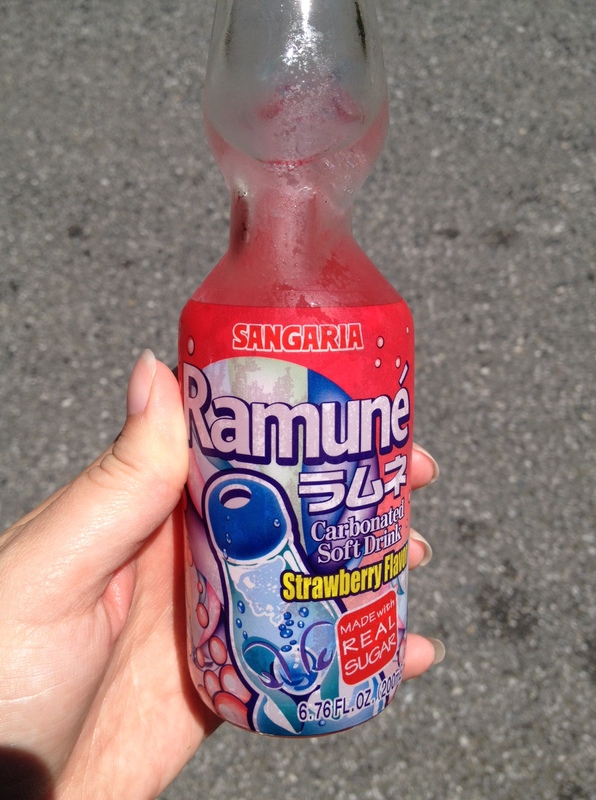 I also got a Japanese soft drink to enjoy while I waited for my meal. 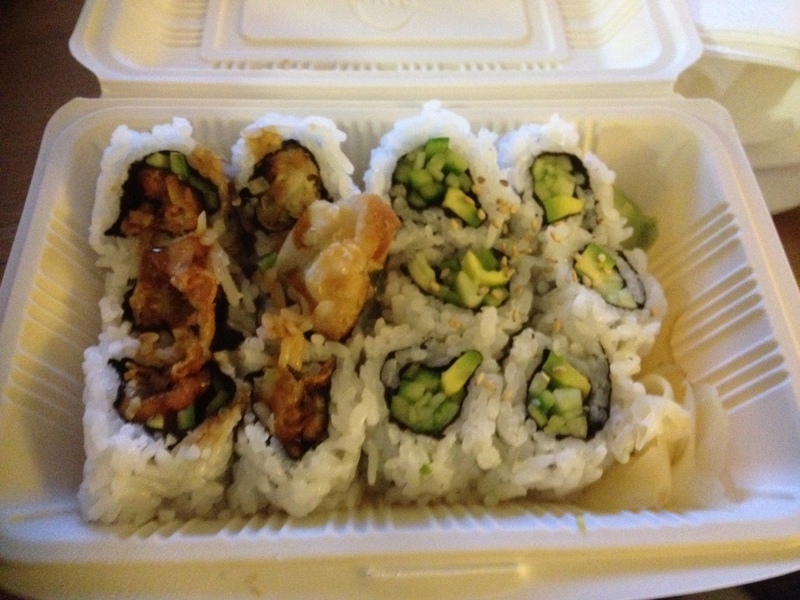 And finally, the wonderful sushi. Mmmmmm. I try not to post the same food twice on here, but I just can’t describe how great this roll is. And with that we can finally move on to yesterday’s Edgewood Eats. Like many, I am sad to see this event coming to an end. They are looking for a new location but haven’t found one yet. 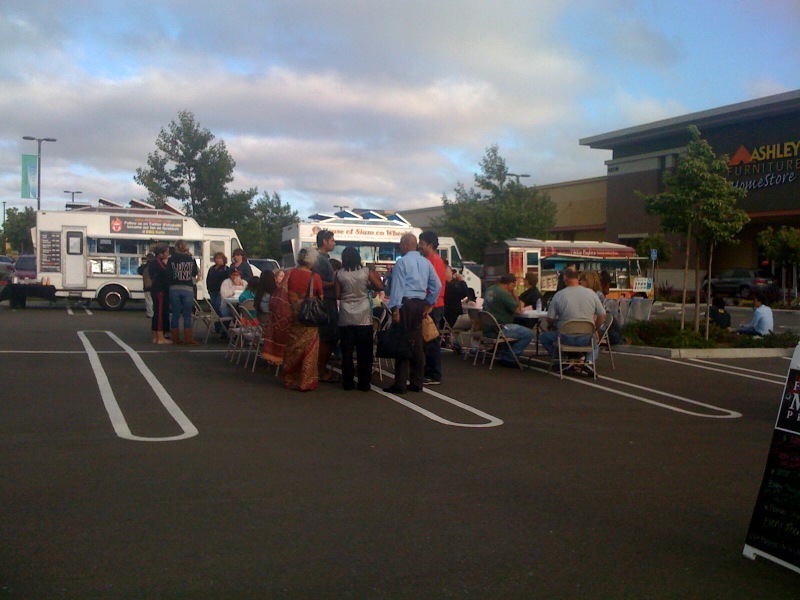 Edgewood was the first food truck gathering I attended in the bay area, and I’ve been going since February of 2011. 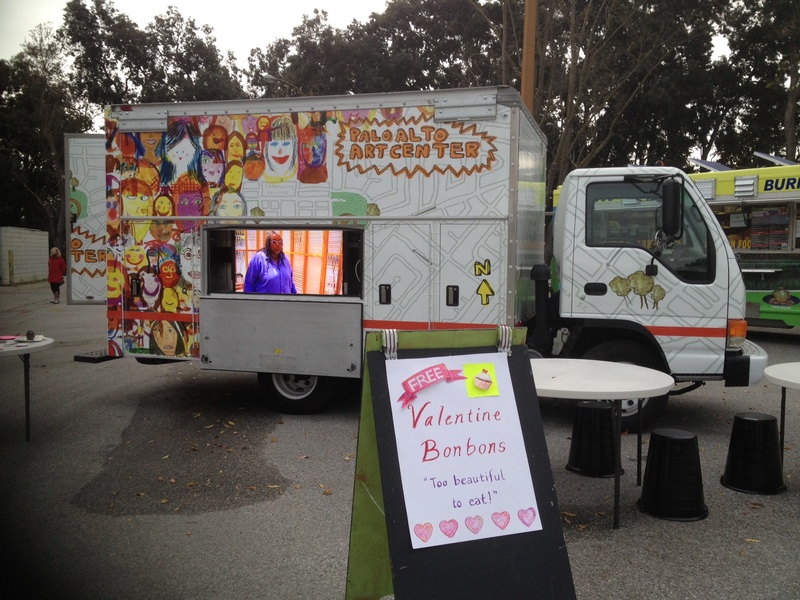 I have discovered many, many new trucks there and will always associate the event with my earliest food truck memories. As I approached the shopping center for the last time before it is broken down, I saw that someone had spray painted a greeting along the wall. Now, as those who follow Food Truck Nerd might know, he considers it a “Pacman” when you eat at five or more trucks at one food truck gathering. I have never attempted a Pacman, although I have inadvertently completed many Ms. Pacmans (four trucks) without trying. I didn’t exactly plan to complete a Pacman at the final Edgewood, but as I bought food and realized I was buying small portions, I also realized that a Pacman was completely within my grasp. It helped that I wasn’t rushing and was chatting with Dan Hugo throughout my time there. Unfortunately, since I didn’t realize I was achieving a Pacman until halfway through it, I didn’t take photos of all of my items. Dan will have to serve as my witness. I usually only photograph the food I haven’t had before, and some of the food I got was food I’ve tried many times! 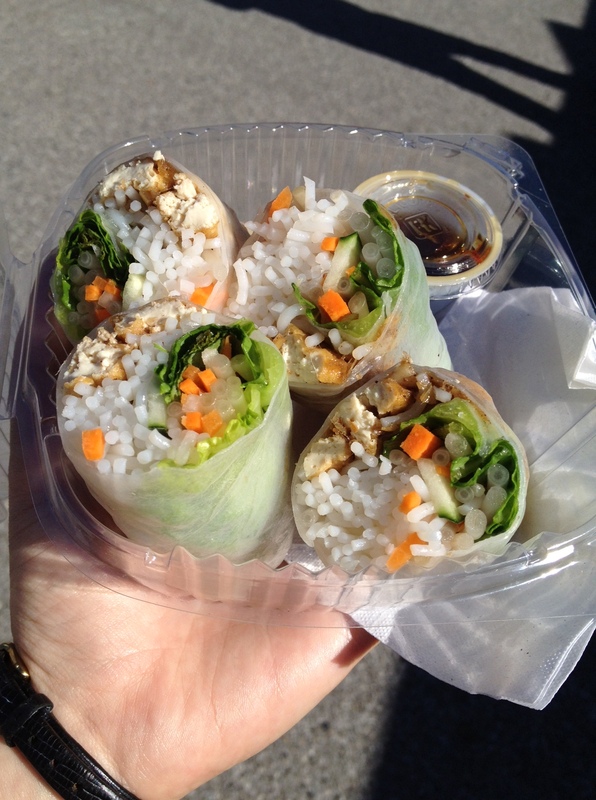 I started my Pacman journey with a menu item at Little Green Cyclo I hadn’t tried before, tofu spring rolls. I had seen them serve duck spring rolls many times, but this was the first tofu ones. I jumped at this opportunity since spring rolls are one of my weaknesses. They were out of the peanut sauce that comes with them, but I got a soy sauce instead that complemented the spring rolls nicely. 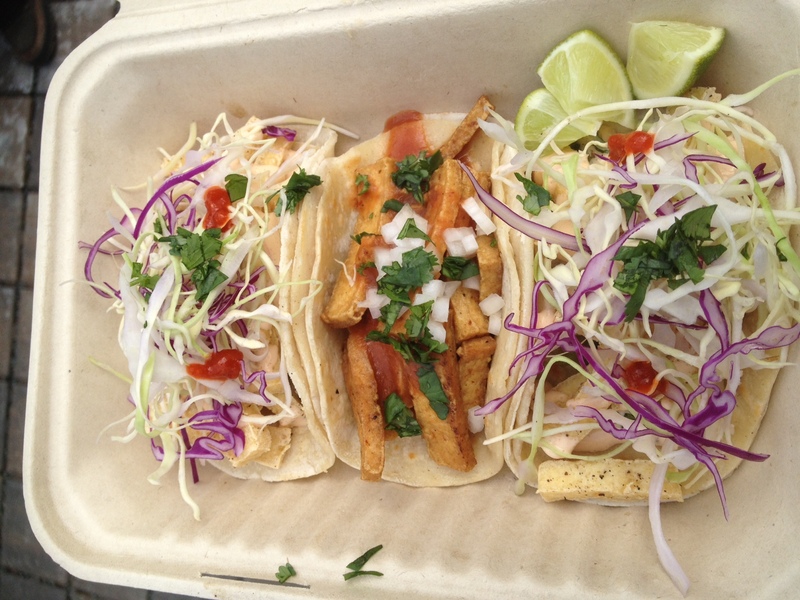 My next stop was House of Siam on Wheels for my usual favorite, the tofu taco. Sadly, no photo was taken. The third truck I visited was Conklin’s Catering, a truck I had only seen once before and hadn’t been too impressed with in terms of vegetarian options. This time I ordered some of their roti, which usually comes with a dipping sauce that has meat in it. Dan suggested I get a soy vegetable sauce that comes with one of the other menu items with it instead. I then waited about 20 minutes to a half hour for a little bit of bread. Dan ordered his meal after me and got it and ate it in the time it took them to bring my order up. I was rather disappointed. 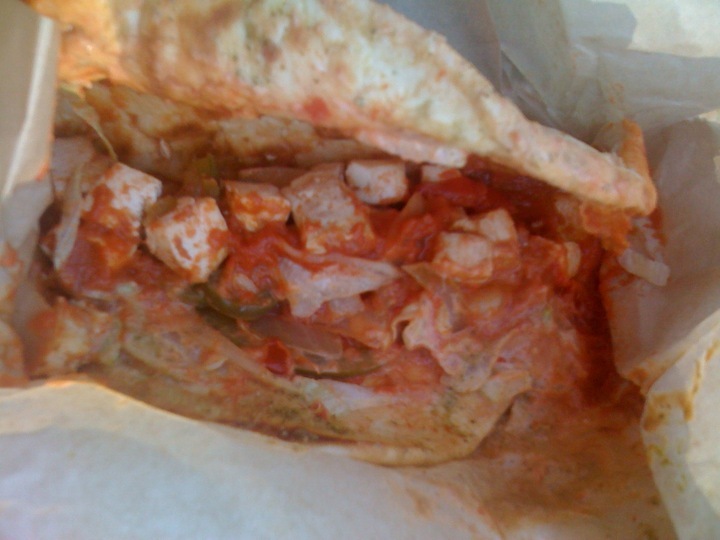 The roti itself wasn’t bad, but the “vegetable” sauce had exactly one slice of a vegetable in it. While we waited, I heard one other vegetarian and one vegan ask about meat free options and get turned away by the truck’s staff. 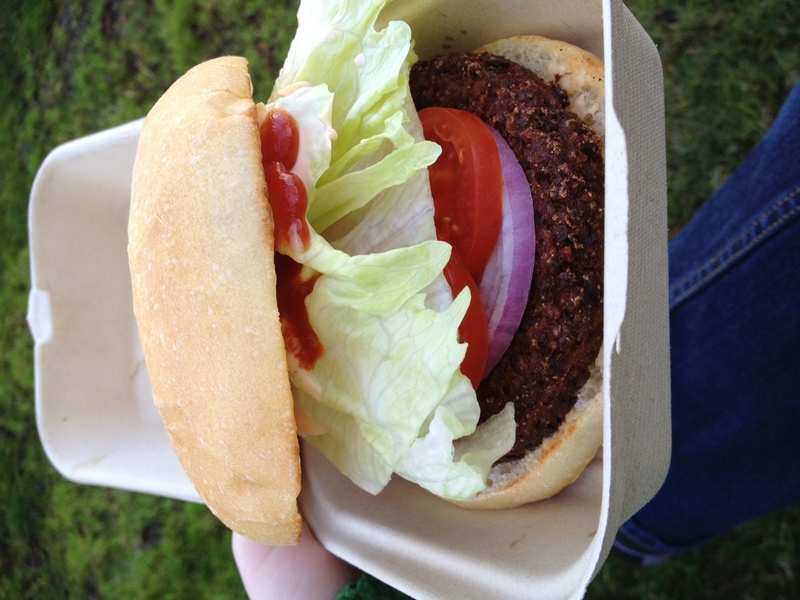 I try to be understanding of trucks without vegetarian options, but it really looked like they were losing business because of it, and it wouldn’t be difficult for them to just remove the beef from some of their menu items and make them vegetarian. As much as I hate to write negative reviews of trucks, I think it’s safe to say I won’t be returning to this one anytime soon. The fourth truck of my Pacman was a much better experience. I ordered an avocado roll from We Sushi, and they let me know ahead of time that it would be 15-20 minutes. I was grateful for that knowledge because it allowed me time to go to another truck and pick up dinner for Kyle. (Don’t worry, I’m not counting that in my Pacman since I didn’t eat it!) When I came back, my food was ready when it hadn’t even been fifteen minutes yet. Unfortunately, I also didn’t take a photo of this item since I’ve had it before. 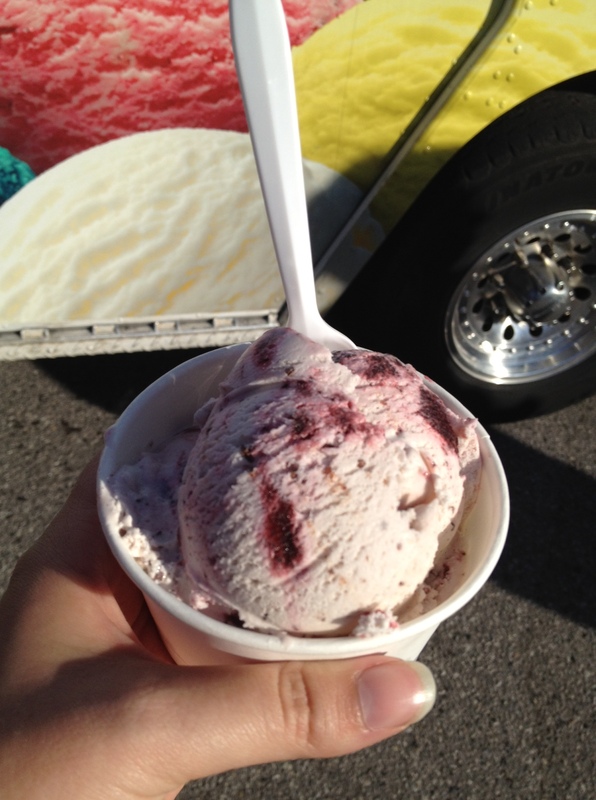 The final leg of my Pacman took place at Scoops where I tried a flavor I hadn’t had before, the raspbernet chip. It was a refreshing end to my Pacman on such a hot day. By this time, Edgewood was the most crowded I’d ever seen it. Dan said they should have their last Edgewood every week with that kind of turnout. Today I ventured to Hiller Aviation to check out the trucks there for the first time, but I will save that for another post. I will leave you with a not-exactly-food-truck-related reminder that today is 7/11 which means it’s free Slurpee day! Don’t forget to get your free Slurpee. If you live in San Jose, I recommend the 7-11 on First and Gish. I’ve also had luck with the one on 11th and San Carlos in years past, but the one at 6th and St. James has told me they don’t participate in free Slurpee day before… pshaw! I’ve gotta say, it’s nice to be writing a mere week after my last post. This means I get to write a little more thoroughly about each truck and all of my food truck experiences. 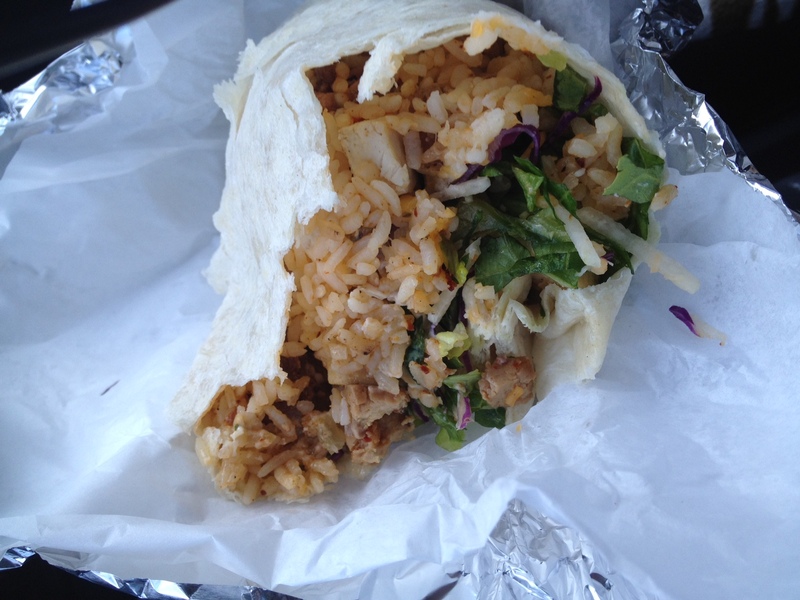 Last week I went to Edgewood Eats on Tuesday. There was a new truck I hadn’t heard of there. 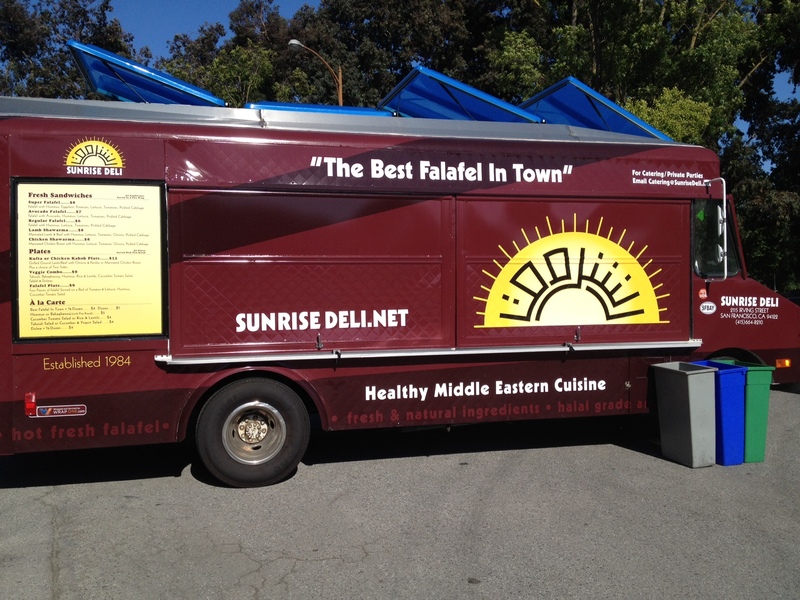 Sunrise Deli seems to be a brick and mortar restaurant that became a truck. When I saw falafel on their menu, I was in. 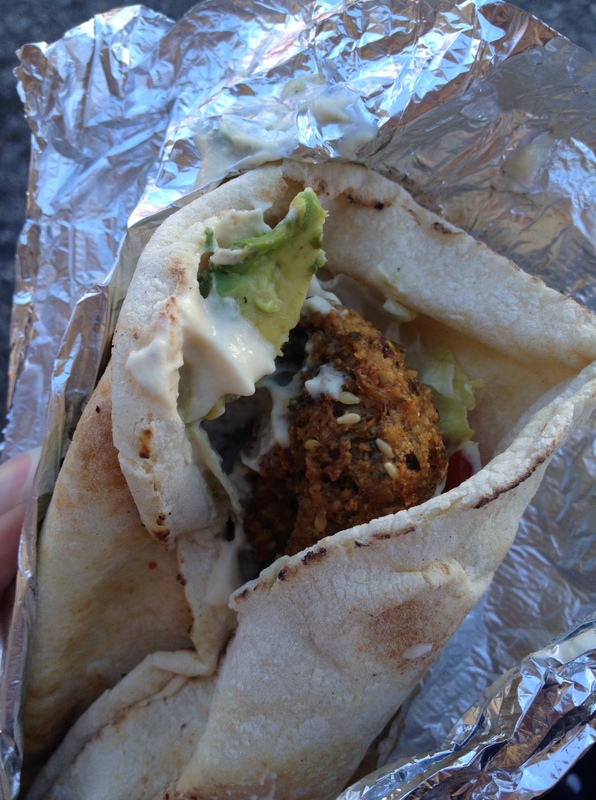 It had been far too long since I’d had falafel from a food truck! As you can see, their doors were down when I arrived about twenty minutes after Edgewood started. I was willing to wait to try a new truck though. It didn’t take much waiting either, and before I knew it I had ordered my avocado falafel wrap. I have to admit, I pretty much inhaled it. I couldn’t help it; falafel is so yummy, especially when paired with avocado. I don’t know how I never had falafel until I became a vegetarian. 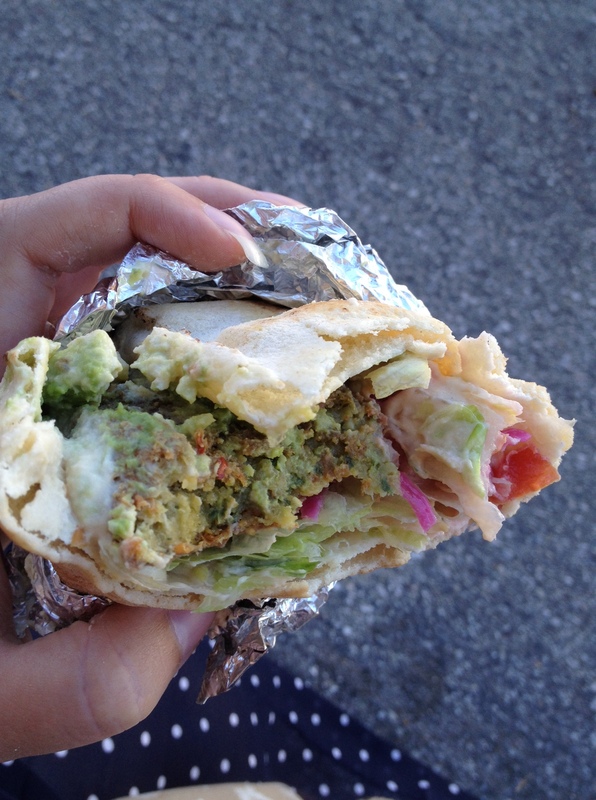 I feel like I have 27 years of falafel eating to catch up on. 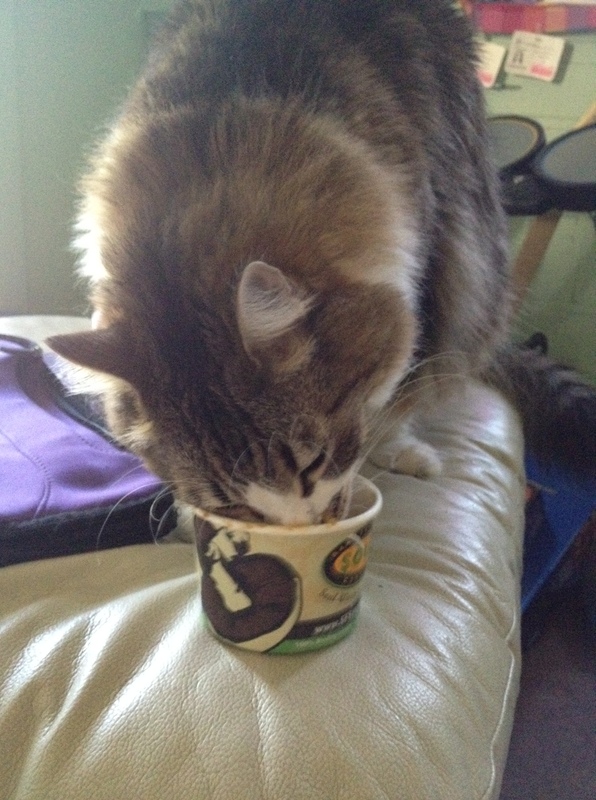 I also stopped by Scoops and grabbed a scoop of their birfday cake flavor. The gentleman taking my order made sure I pronounced the name the “right” way before serving me. He also took a photo of me and put it in the “happy customers” folder on their facebook page here. 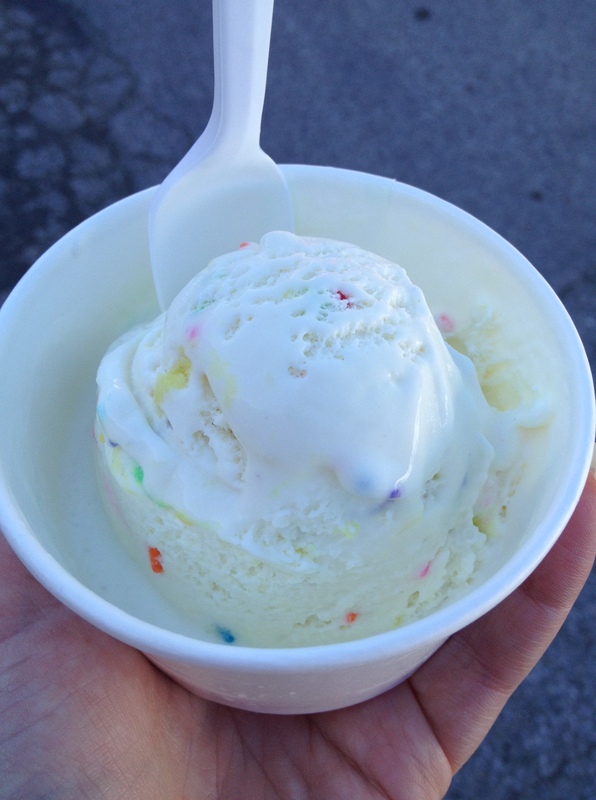 I ate a bit before I got a really good photo of all the colors of confetti in this ice cream. 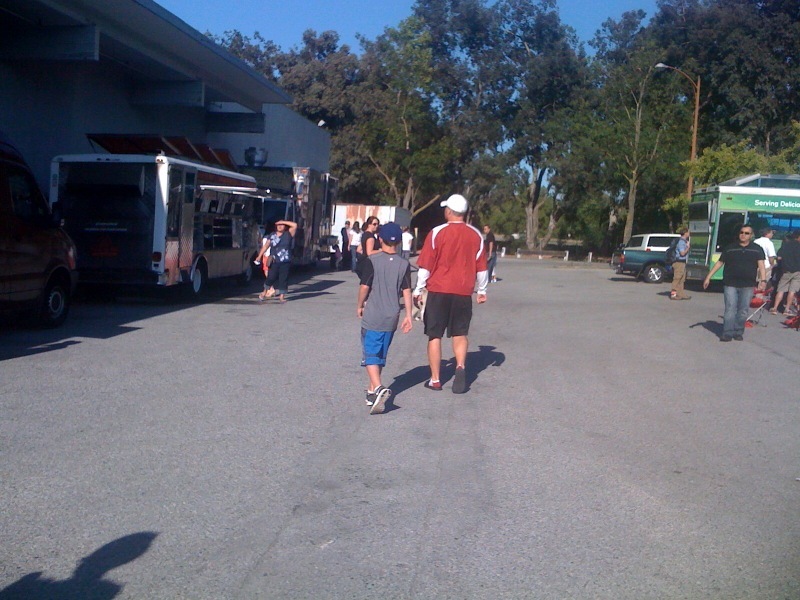 On Friday, Kyle and I decided to go to a Word on the StreEatz event at Piedmont Hills High School for dinner. 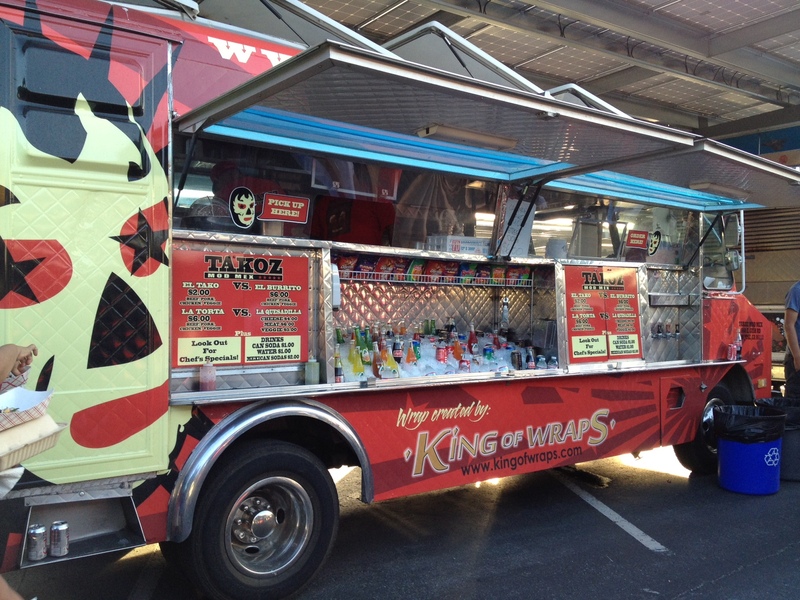 While there I got to try a new truck I’ve heard lots about but hadn’t run into yet, Takoz Mod Mex. 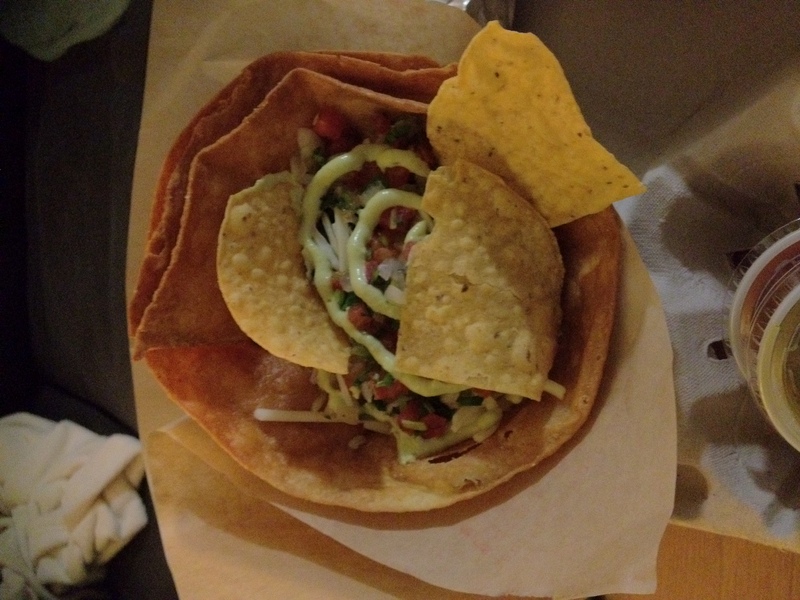 I ordered a vegetarian “el tako”. I was impressed with all the toppings which consisted of more than just the regular toppings you see on a traditional taco. It was very yummy. My next stop was the Dough Truck. 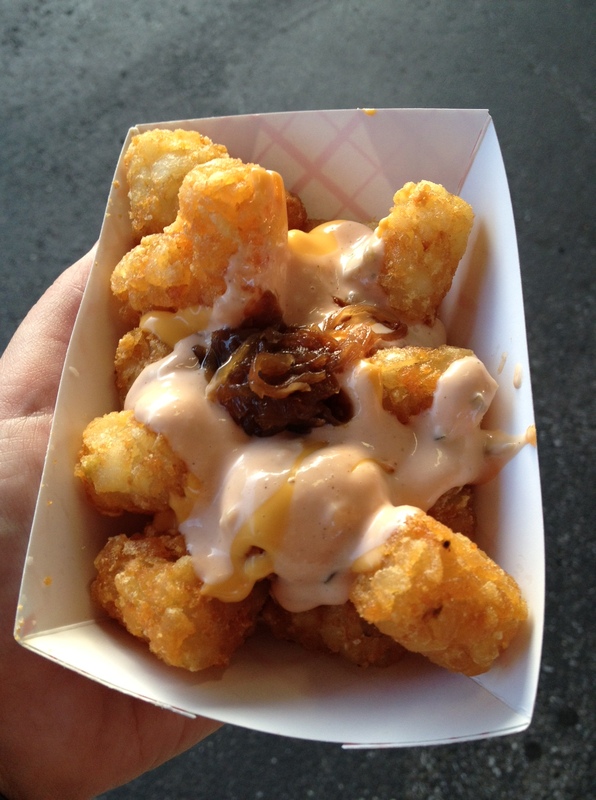 I had been wanting to try their tater tots ever since listening to Food Truck Nerd’s podcast about them. After verifying that the “special sauce” was vegetarian, I ordered the Animal, which is basically tater tots served animal style like at In-and-Out: melted cheese, special sauce, and onions on top. 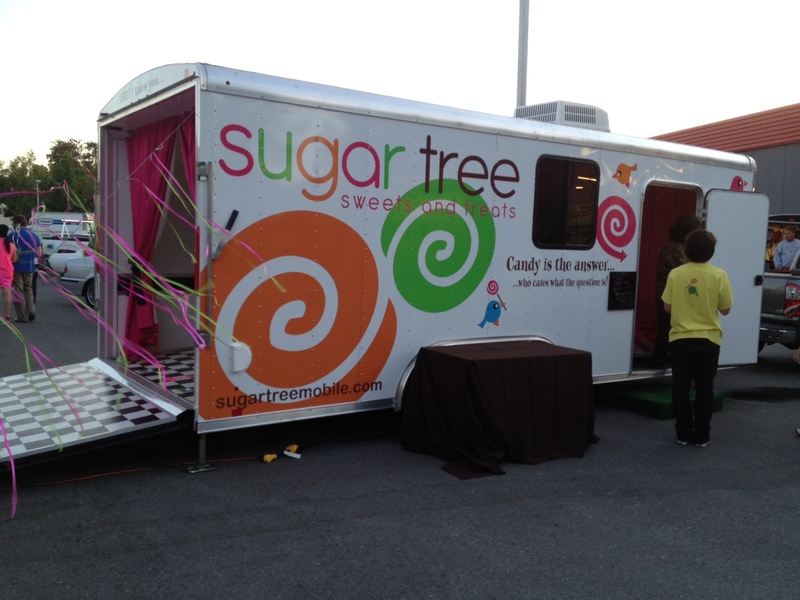 From there, we drove to Club Auto Sport where a new candy truck, Sugar Tree Sweets and Treats was serving at an event. If you know me, you know that I love candy. I couldn’t pass up the opportunity to try a new truck that includes candy. When we got there, we quickly discovered that this was a HUGE event. It took forever to find parking, and we felt like we were crashing someone’s party. Eventually, though, we found our destination. Shelves of candy, and checkered floor! It took some deliberating, but I eventually decided on a small bin of organic blueberry cotton candy, a red velvet cake pop, and a packet of fun dip (an old favorite from my childhood). The cotton candy had just the right amount of flavor without being too sugary sweet. 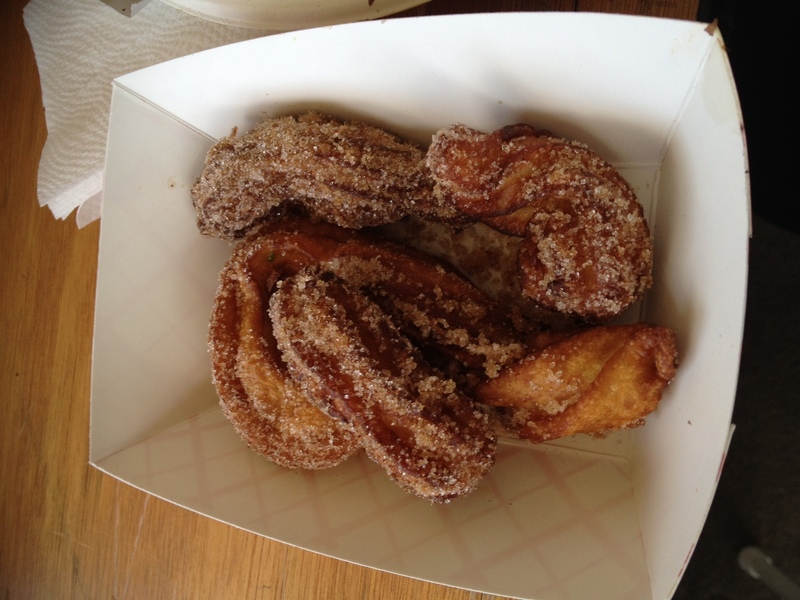 It definitely tasted healthier than the kind you get at the carnival. 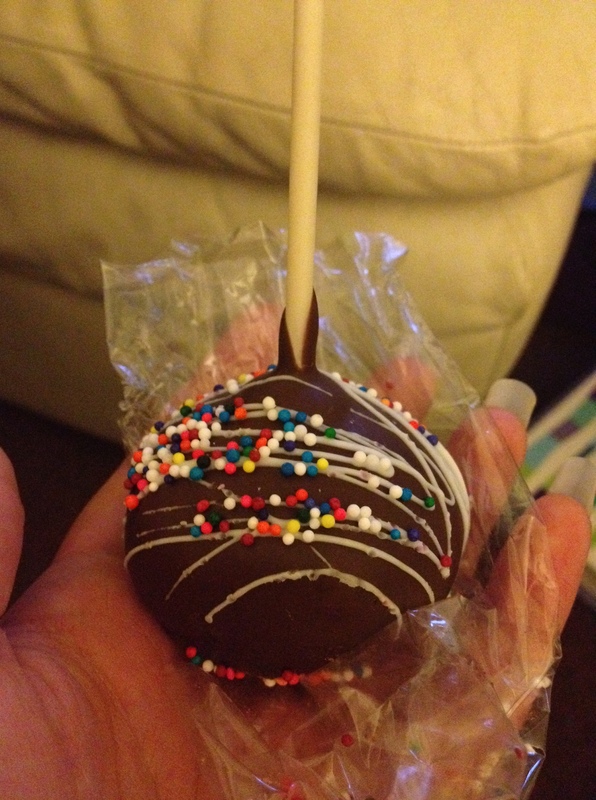 The cake pop was incredible. I don’t know how else to describe it, just utterly delicious. This morning, I woke up and had a mediocre half-breakfast of stale cereal. I quickly realized I need to do some grocery shopping and would need to go to a food truck for lunch before then. 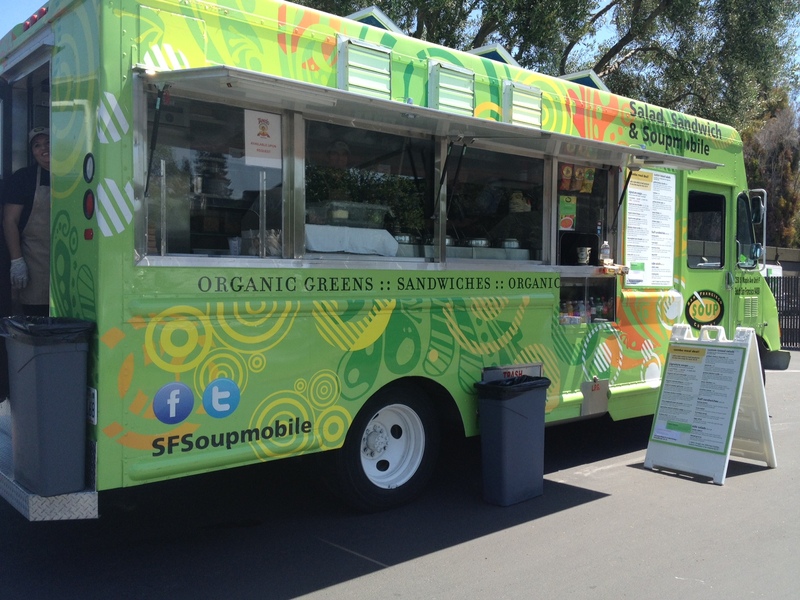 When I checked roaming hunger, I saw a food truck I hadn’t heard of before in Mountain View, another one that seems to be a brick and mortar gone mobile, SF Soupmobile. They had a lot of vegetarian options, and all of them sounded delicious after my poor excuse for a breakfast. 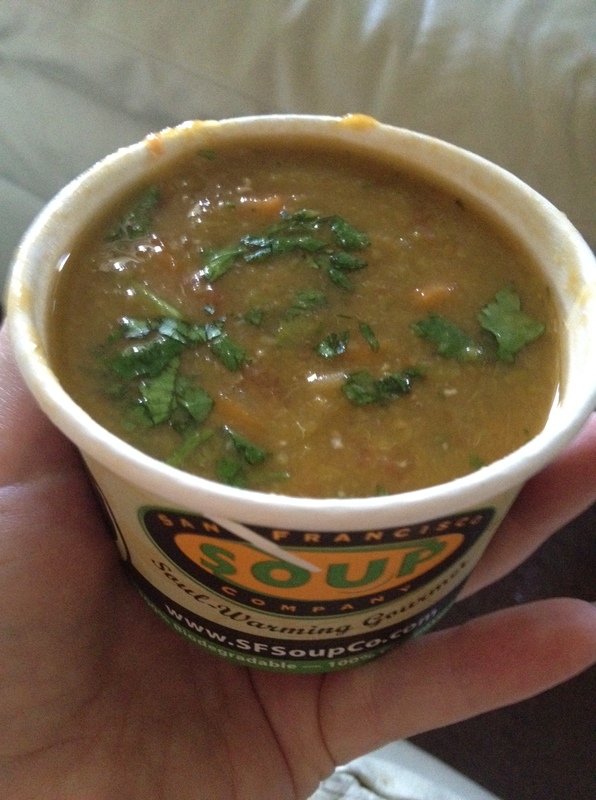 I decided to try a couple at once and went for a small bowl of the split pea soup and a half hummus wrap. After I ordered my food it was ready almost immediately. The soup seemed too hot to eat right away, so I decided to just high-tail it home. Luckily, I live close enough for the soup to still be warm when I got there. 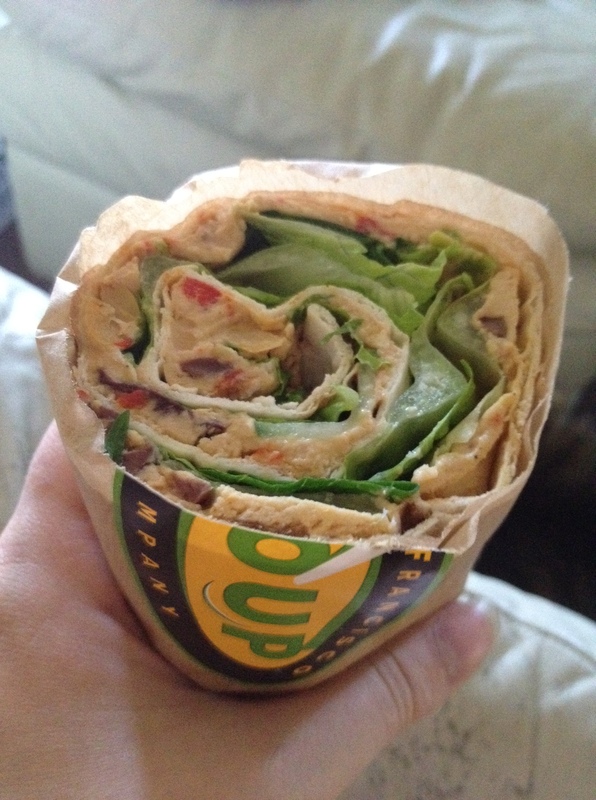 The hummus wrap was the perfect blend of flavors. I though the kalamata olives were an especially good touch. I consider myself a bit of a split pea soup snob because I grew up going to Andersen’s on family vacations, and I think nothing measures up as a result. This split pea made the cut though. They also included a bit of a sourdough roll for dipping purposes, but I didn’t get a photo of it. 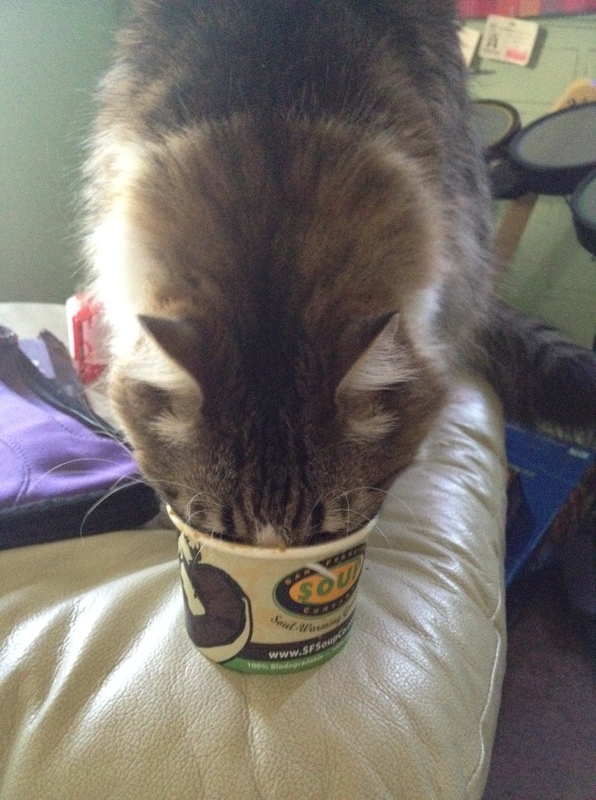 Most importantly, after I finished the soup I let my cat lick the bowl. I think he enjoyed it. I’m not even sure he focused on breathing while eating the soup. This post isn’t just to tell you what’s new though. I have a couple new trucks to write about too! 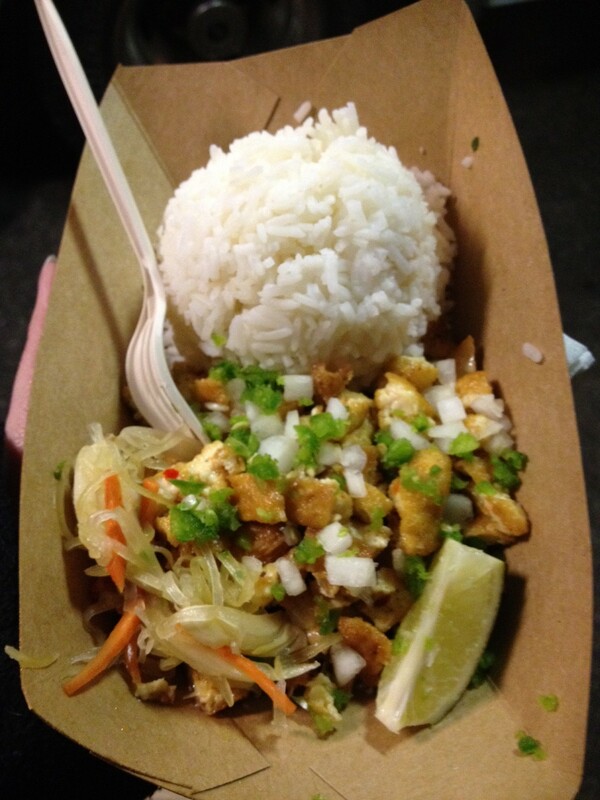 Last week, for the first time, I ate food from a truck I hadn’t visited in person. My boyfriend saw that Twister Truck would be parked near where he lives, so he picked some up for us on his way home from work. 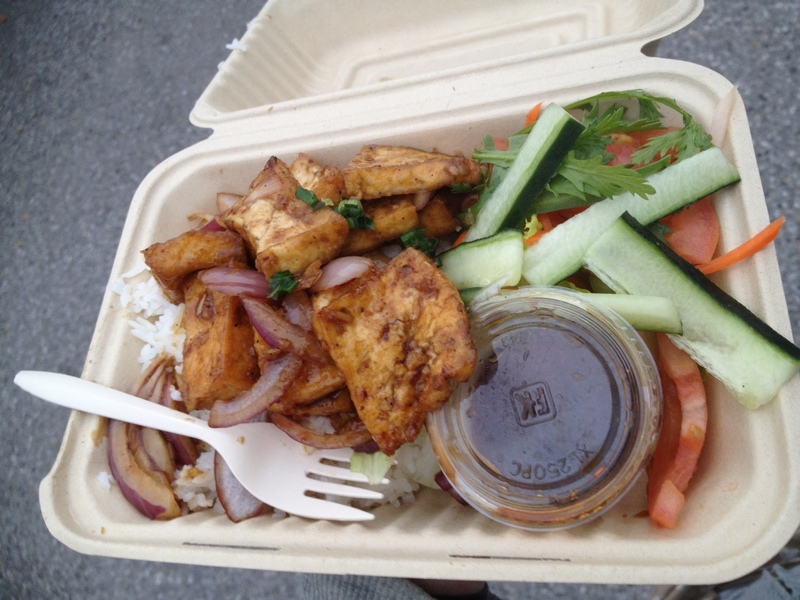 It was a little weird not getting the full food truck experience, but the yummy food made up for it. 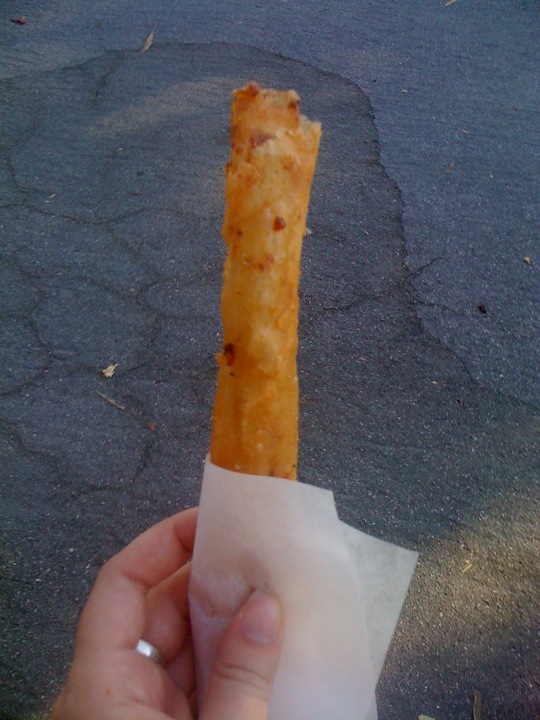 The photo of the twister burrito cone on the website intrigued me, so that’s what I ordered. I was still a little confused as to how to eat it, but it got easier once I decided to just use a fork. 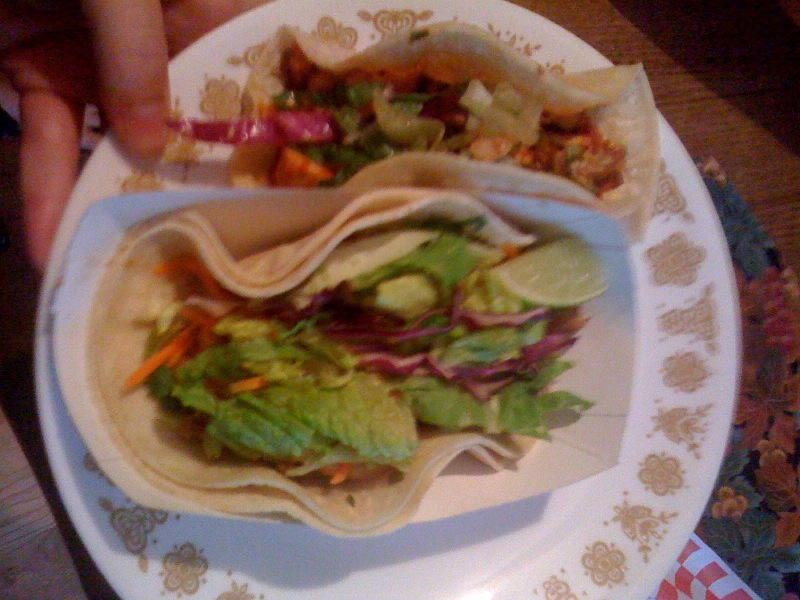 I also tore pieces of tortilla off the cone and used them to scoop up the insides. I thought a side of tortilla chips might help, but then the extra food might be too much because the burrito cone itself was the perfect amount for a meal. 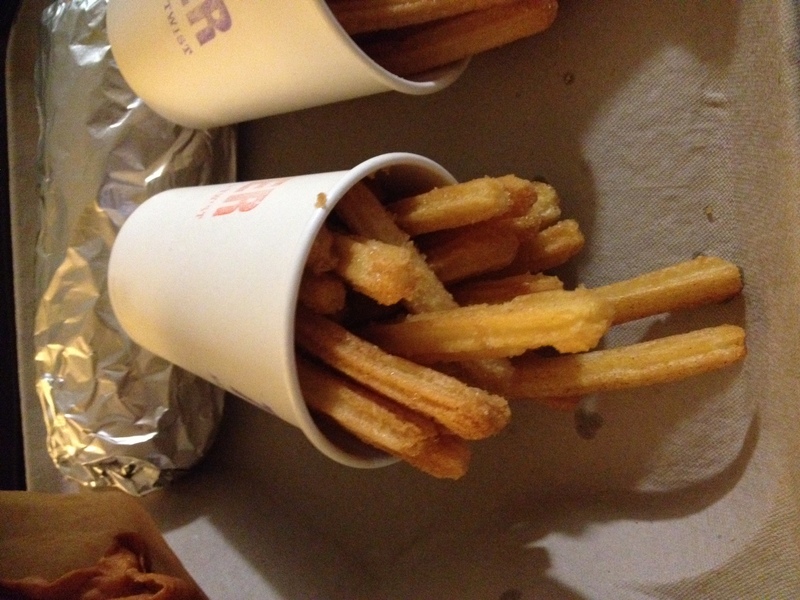 I also got a side of churro fries but wasn’t able to finish them all. My boyfriend didn’t receive the chocolate or cajeta sauce mentioned on the Twister website with them, so they lacked a little bit in flavor. Additionally, all the grease collected at the bottom of the cup making the bottoms of the fries especially gross to a not-so-yummy degree. 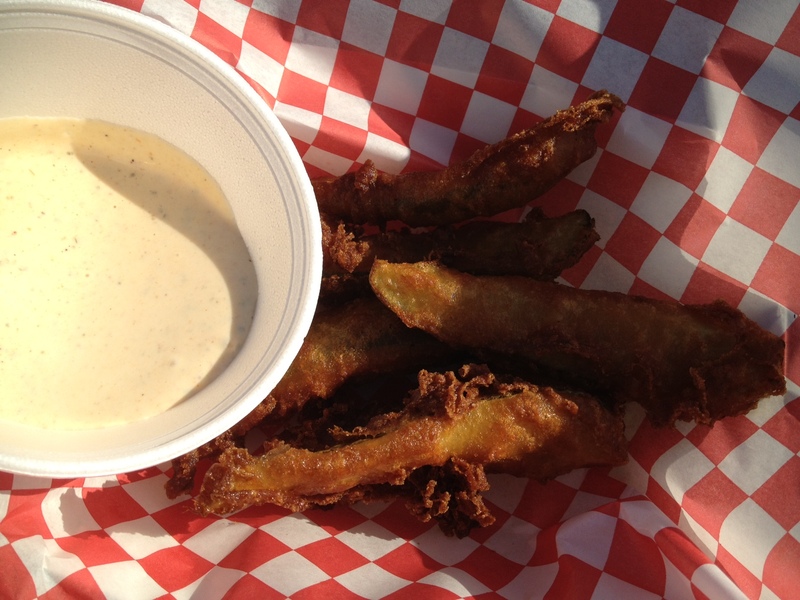 With a little less oil and a little more dipping sauce, I think these could really hit the spot. 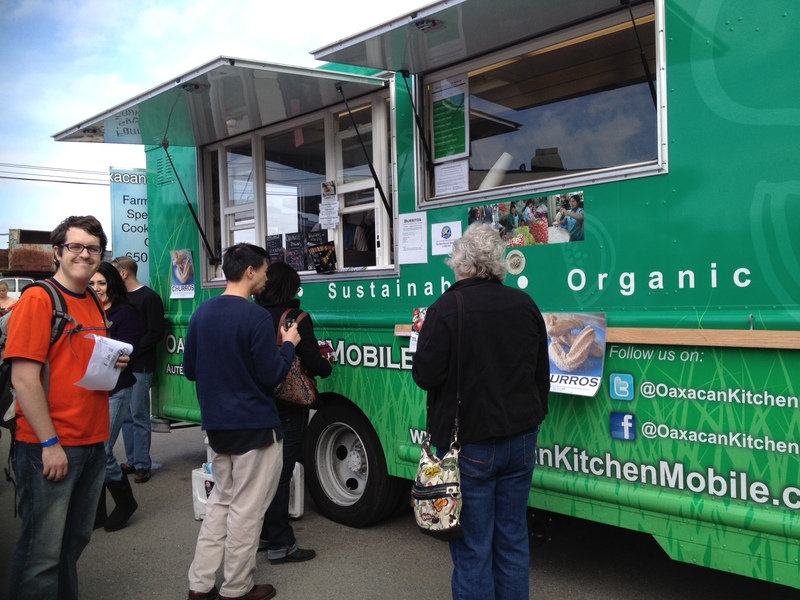 On Saturday, we ventured to the Moveable Feast at the Garden City location. I miss the old ones at San Pedro Square that I could walk to from where I live, but I don’t mind driving a little bit for my food truck fix. I decided to try a truck I had been to before but only for some cookies, Sanguchon. 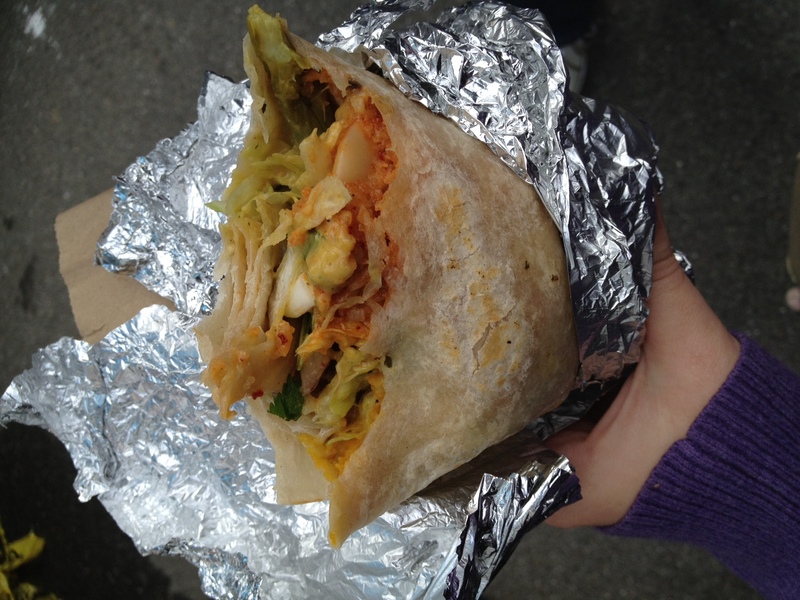 My boyfriend had been raving about their vegetable curry wrap which he had gotten at one of their lunch time stops. 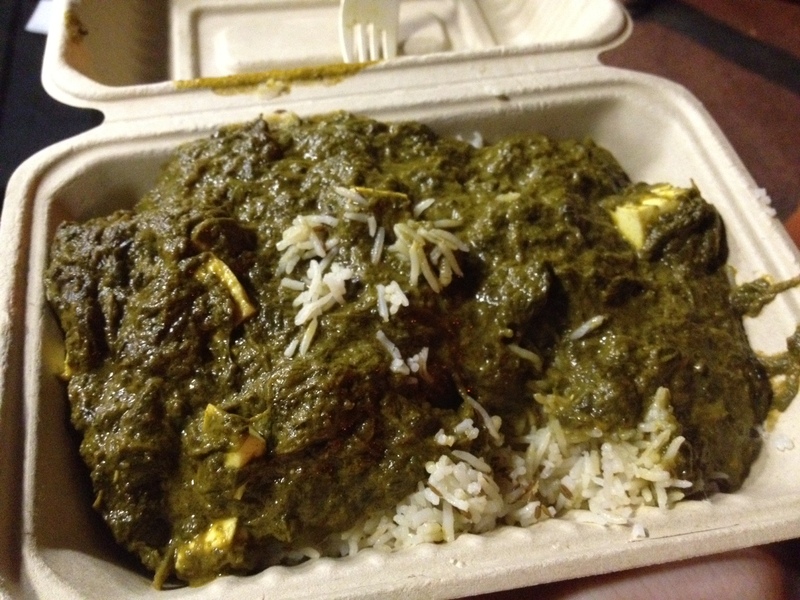 Never having had Peruvian curry before, I wasn’t sure what to expect, but I was pleasantly surprised. What I found was an amazing amount of flavor that filled me up for hours. Every bite included a new vegetable I hadn’t tried before. I found myself taking a new photo every few minutes because I’d look down and see more and more colors. 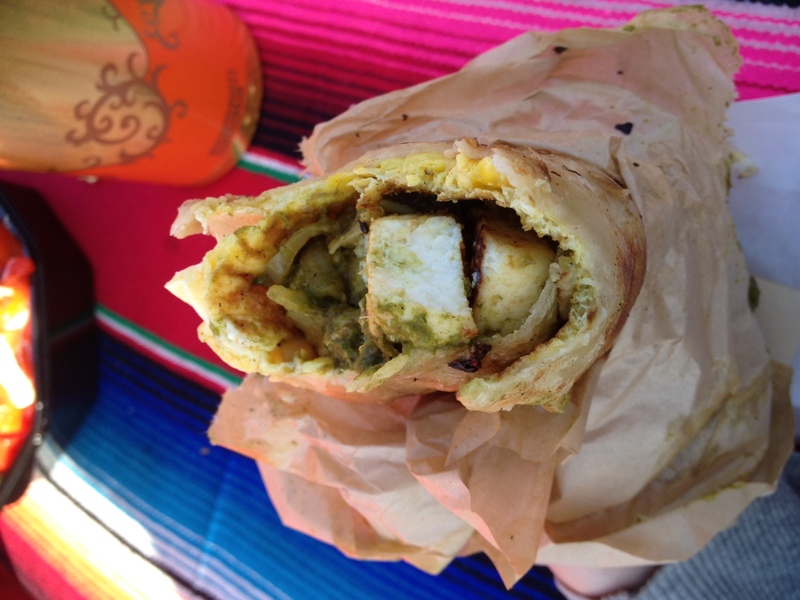 It was an amazingly photogenic as well as delicious wrap! 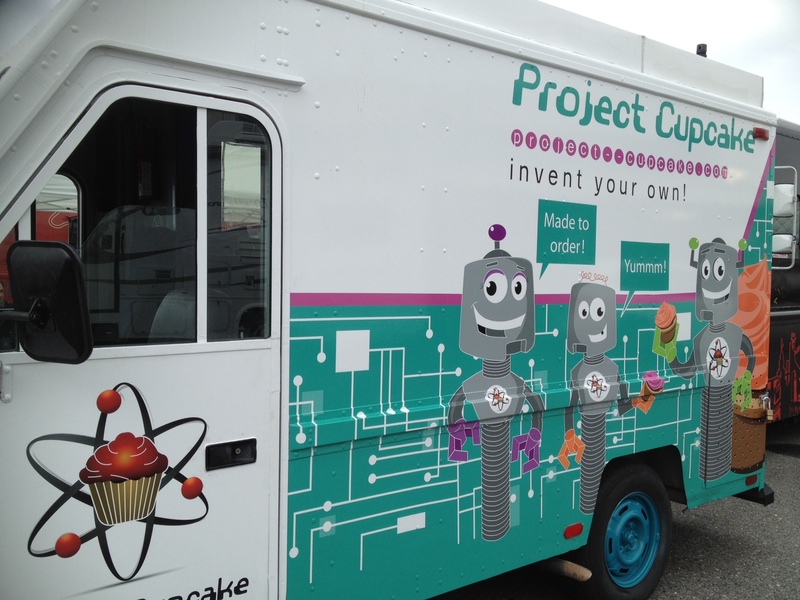 There was also a new truck at the event, Project Cupcake. 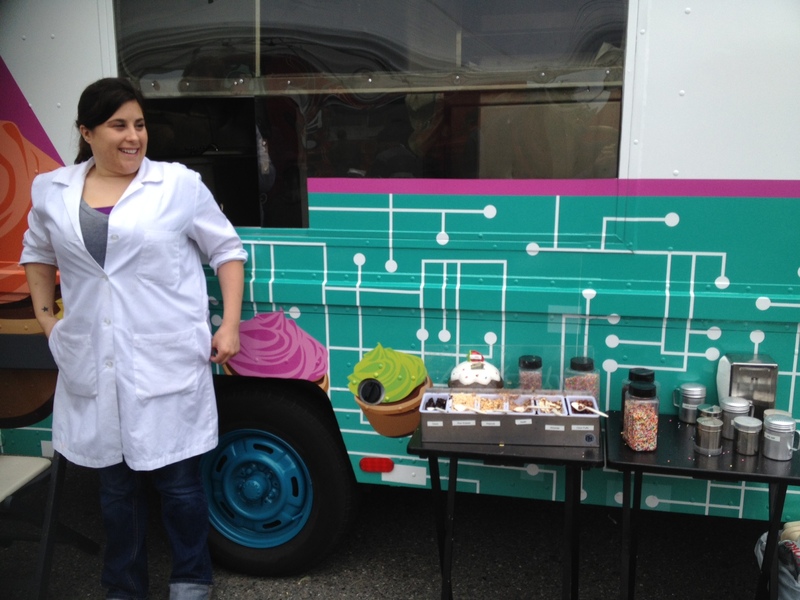 Aside from a clever name and truck design to go with it, this cupcake truck has a different concept than most. They allow their customers to build their own cupcakes, starting by choosing a cake, then choosing a frosting, and then you can put whatever toppings you want on top (similar to a frozen yogurt place). Another cute component is the fact that when you visit them you’re greeted by staff in lab coats. 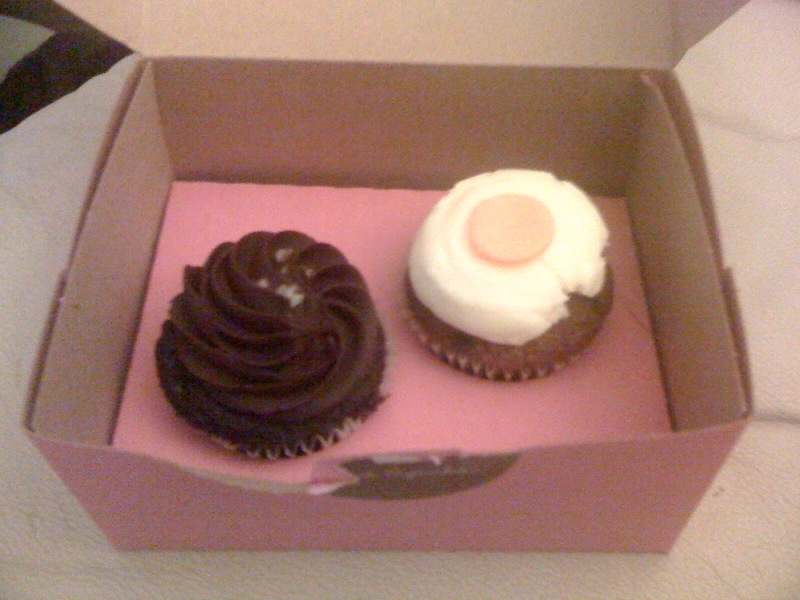 When I got to the truck, they only had six cupcakes left, so I didn’t get to choose my cupcake as specifically as most. 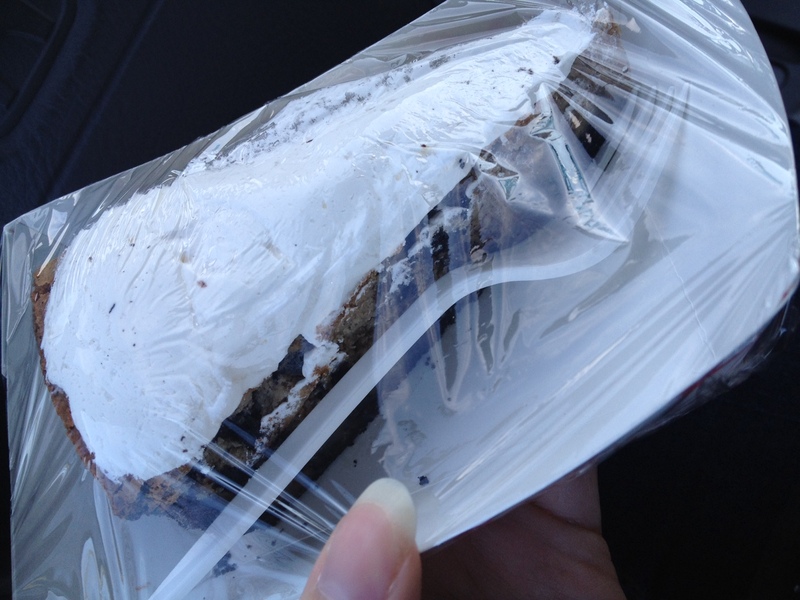 I got the mocha flavored cake with cream cheese frosting. 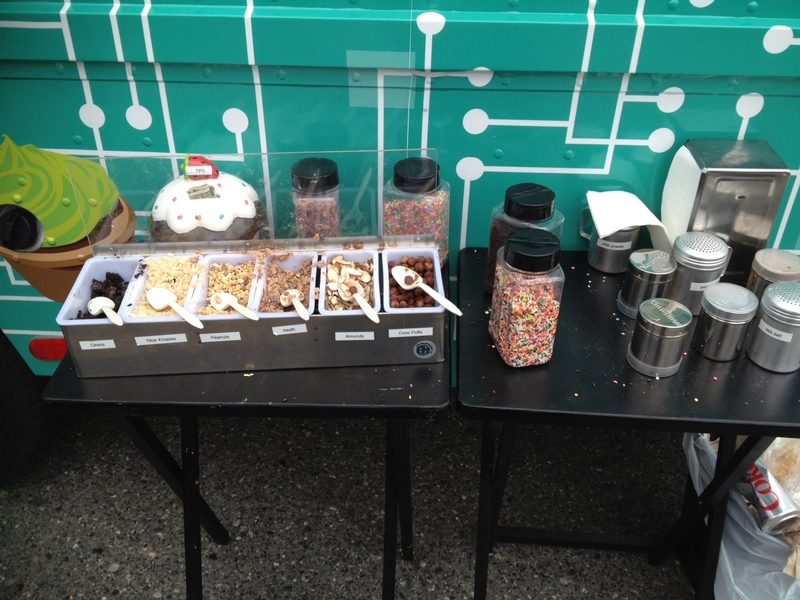 Then I visited their toppings bar and took full advantage of it. 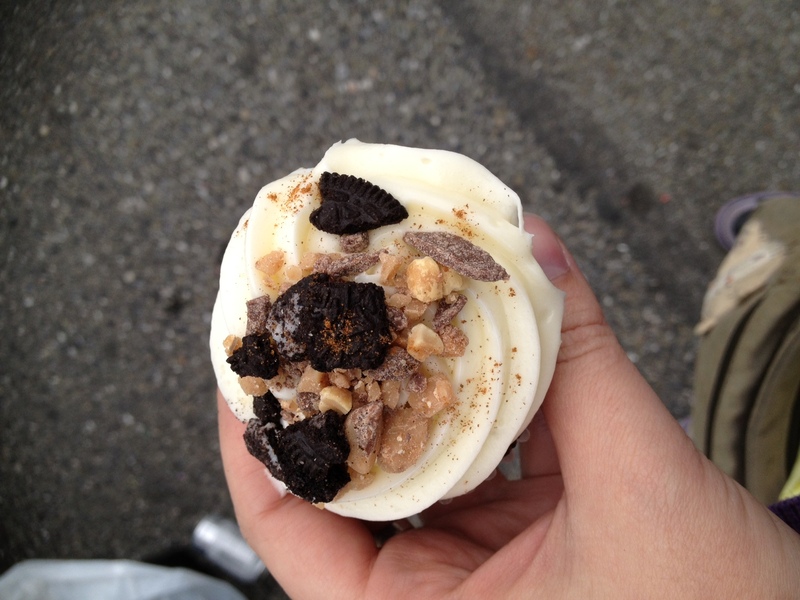 I loaded on some butterfinger bits, oreo pieces, and sprinkled a little cinnamon on top. The result was a super tasty cupcake. I can’t wait to try them again when I can choose my cake and frosting more specifically too! Those are all the new trucks for this time. 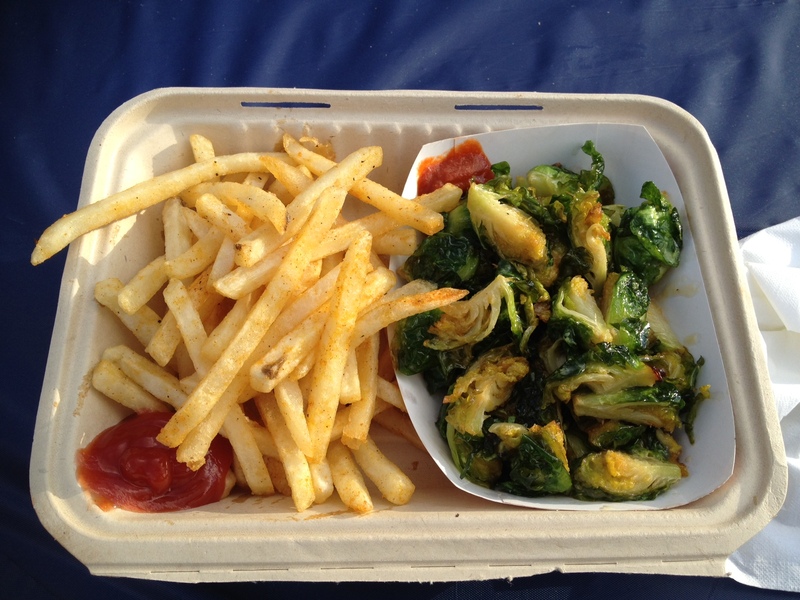 Don’t forget to like Veggie Truckin’ on facebook! 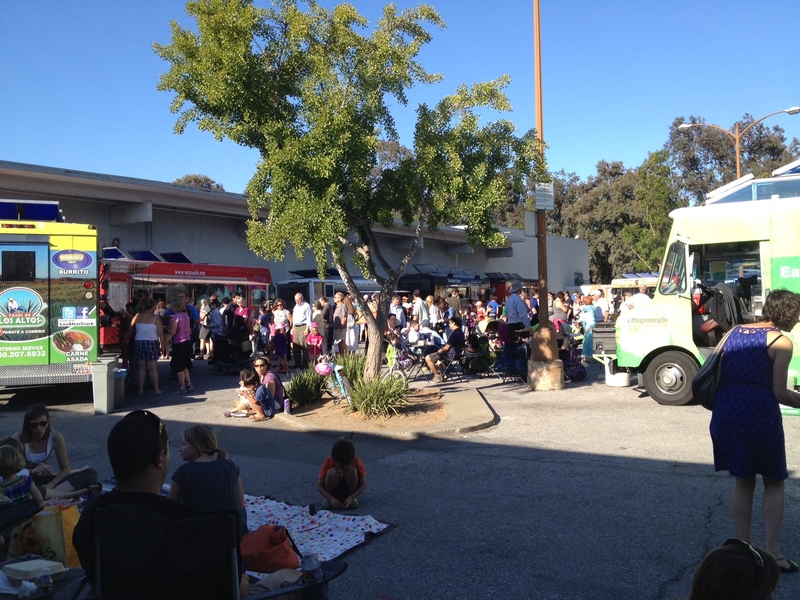 It’s hard to believe, but I’ve been to three food truck gatherings this week. 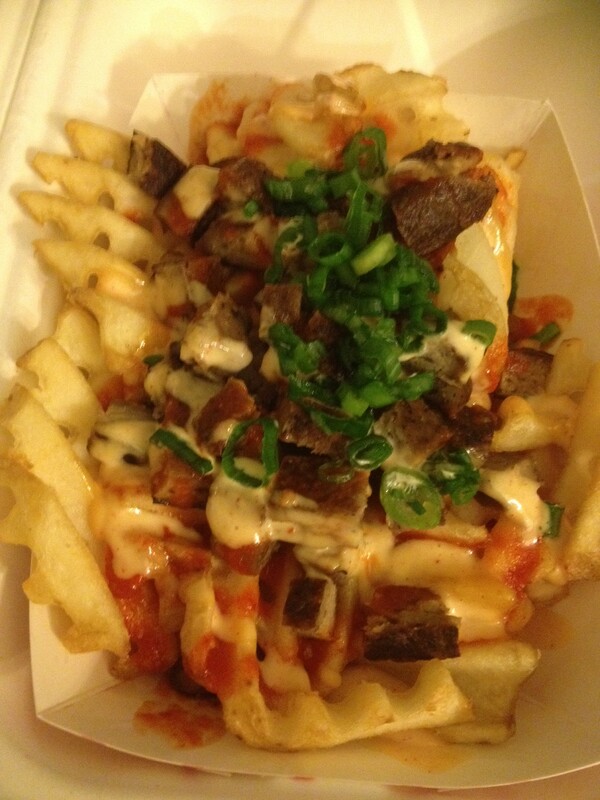 That’s the nature of food trucks in this area now, and I’m totally loving it. In fact, I’m kinda bummed that I’m going to be out of town so much in the next month and won’t be able to frequent my favorite trucks. However, I’m also excited to experience food trucks in other cities (Chicago and Los Angeles, specifically) and share them with you here! 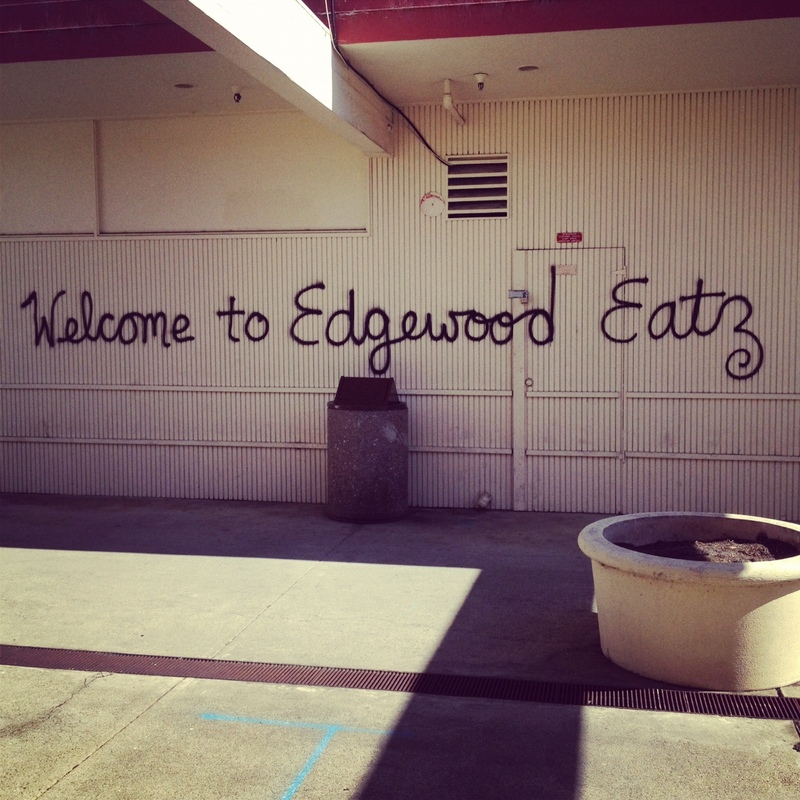 My first stop this week was Edgewood Eats. One of my favorite trucks, Little Green Cyclo was there. This truck was high on my list before I became a vegetarian, but now I love it even more. 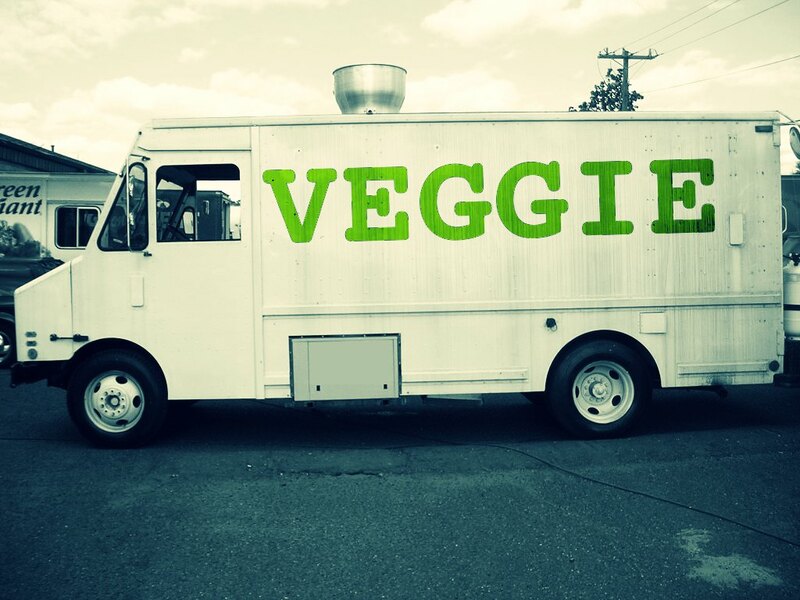 It has multiple vegetarian options as opposed to most trucks which only have one or two. 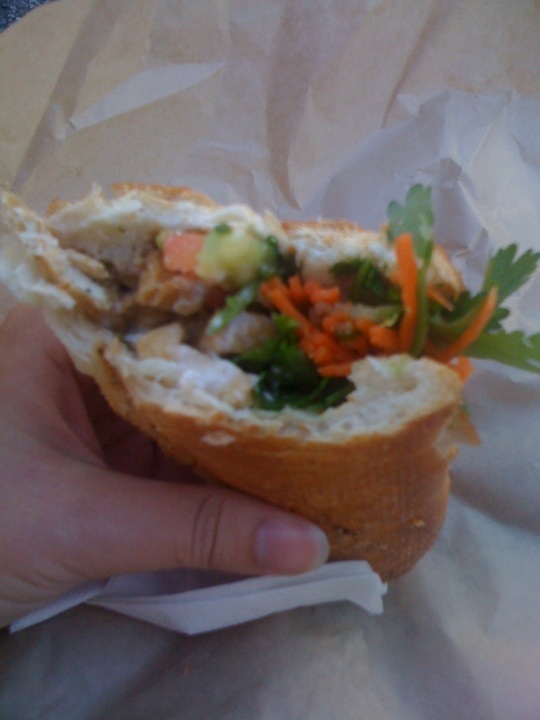 I had had their banh mi with chicken before I became a vegetarian and loved it, so I was excited to try it with tofu instead. It did not disappoint. The sandwich was filling, so I just wanted a little something more. I hadn’t eaten at Curry Up Now in awhile and had never tried one of their deconstructed samosas before. I wasn’t sure how big it would be, but at $6 I figured it wouldn’t be too too much food. I was wrong. It was a lot of food and very filling. That is in no way a complaint; I just didn’t have enough room in my tummy to finish it! 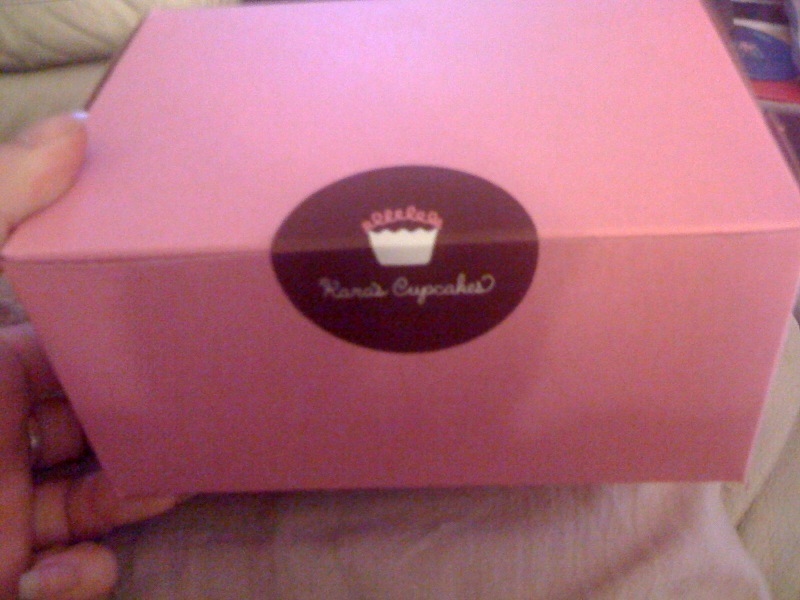 Although I was stuffed, I made one last stop at Kara’s Cupcakes. I love to take two of their cupcakes to go, eat one for dessert later in the night, and have the other one after lunch the next day. 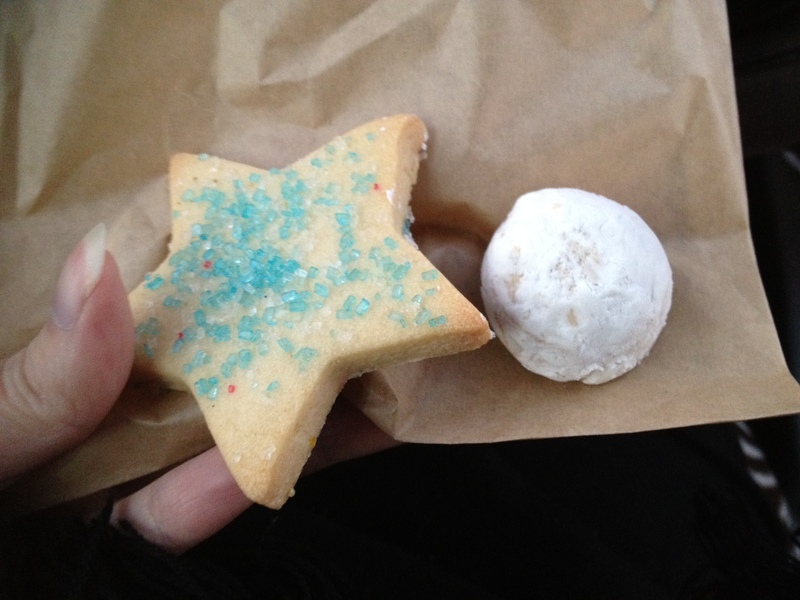 This time around I got the Fleur de Sel and Kara’s Carrot. And now on to my second festival of the week! 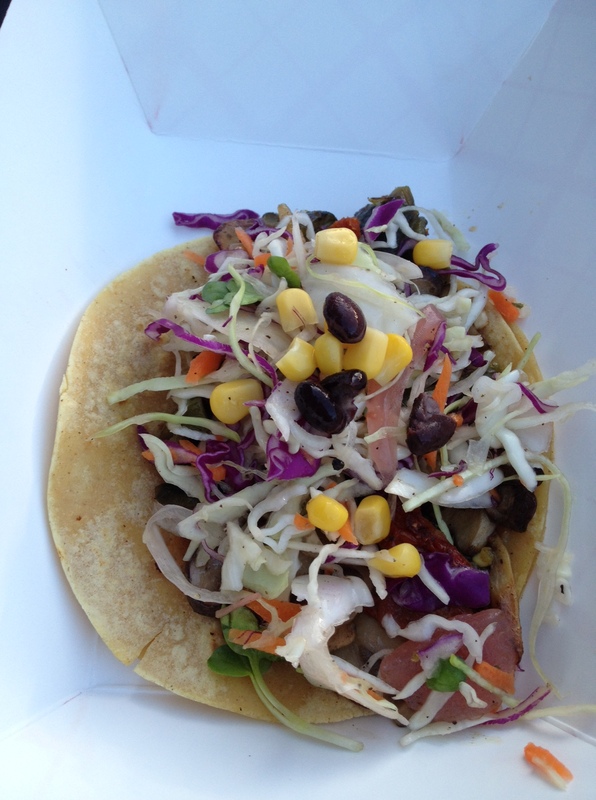 Last night (Friday), I went to the first Fremont Street Eats in the Pacific Commons shopping center in Fremont. 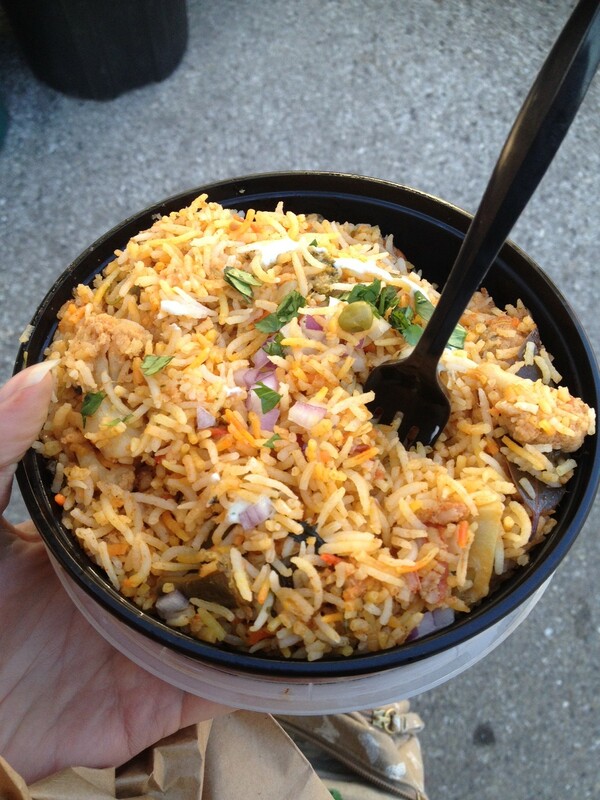 I convinced my mom to have her first food truck gathering experience as well and gave her recommendations for some of my favorite non-veg foods I used to enjoy before I went vegetarian. 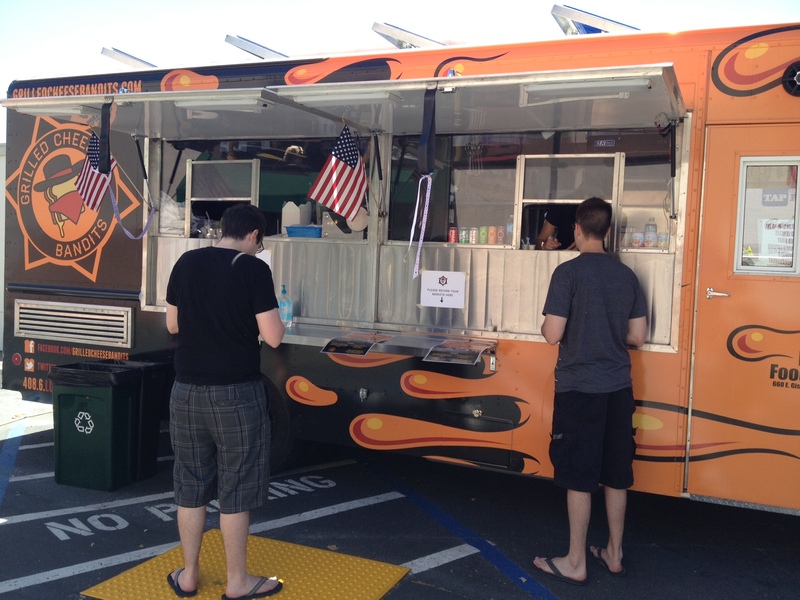 My first stop was Grill Stars, a truck I had yet to visit. 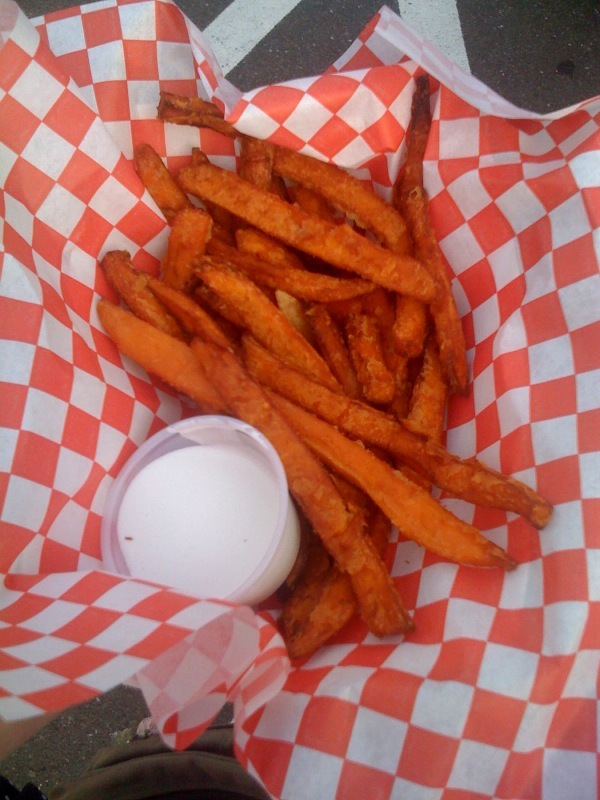 Being a burger truck, they only had one vegetarian option on their menu (although I’ve heard great things about their fried pickles they weren’t serving that night), sweet potato fries. Although I only had to wait for one person in front of me to order, it took an unexpectedly long time for my fries to be prepared. In fact, I went to another truck while I waited, and my food still wasn’t ready. I’m sad to say that when I finally did get my fries, I wasn’t that impressed with the flavor. 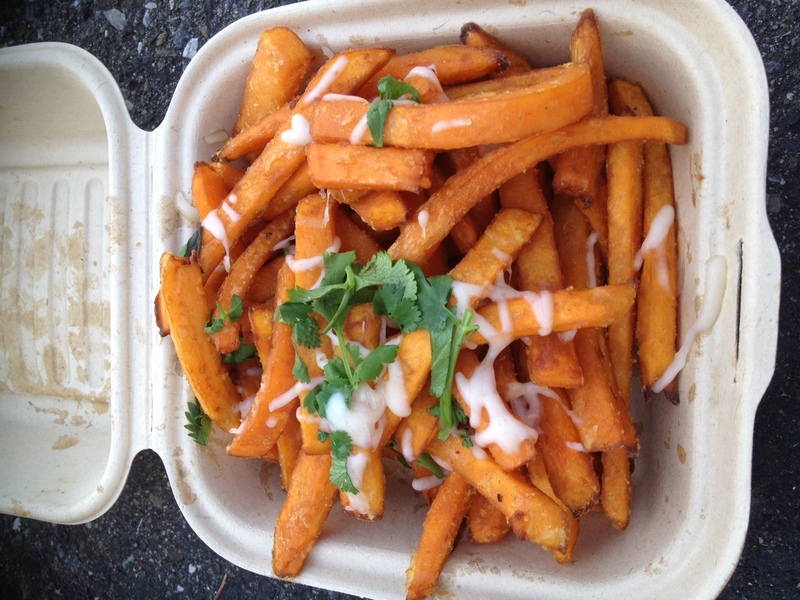 They were missing the usual bite sweet potato fries have. It felt like they just barely fell short. 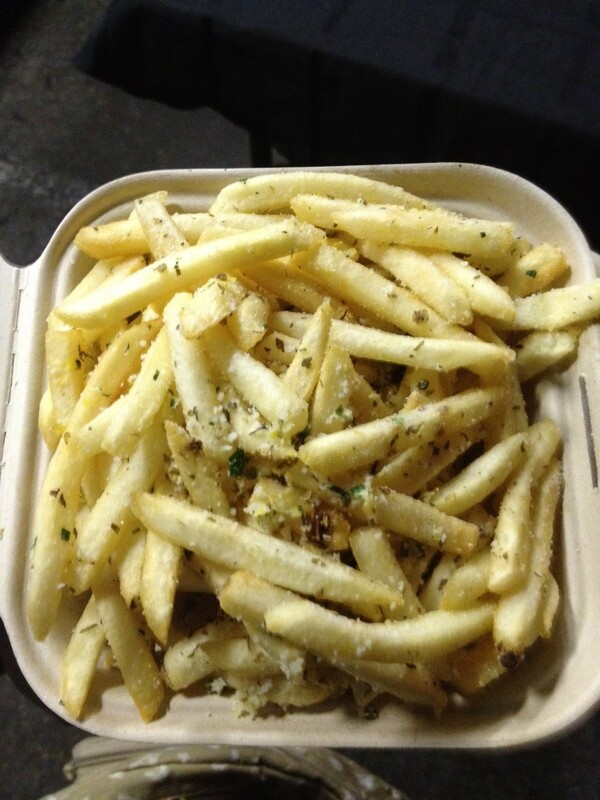 The fries also came with a marshmallow dipping sauce, but I didn’t try it since most marshmallows contain gelatin. Considering how long I waited, I’m assuming that they make their food as it’s ordered, so maybe in the future I can order their nachos without meat on them. I’m trying not to write this truck off completely after one bad experience; after all, they’re still a rather new truck, so maybe they still need to work out the kinks. The truck I visited while I was waiting for my food at Grill Stars was That’s Sweet! 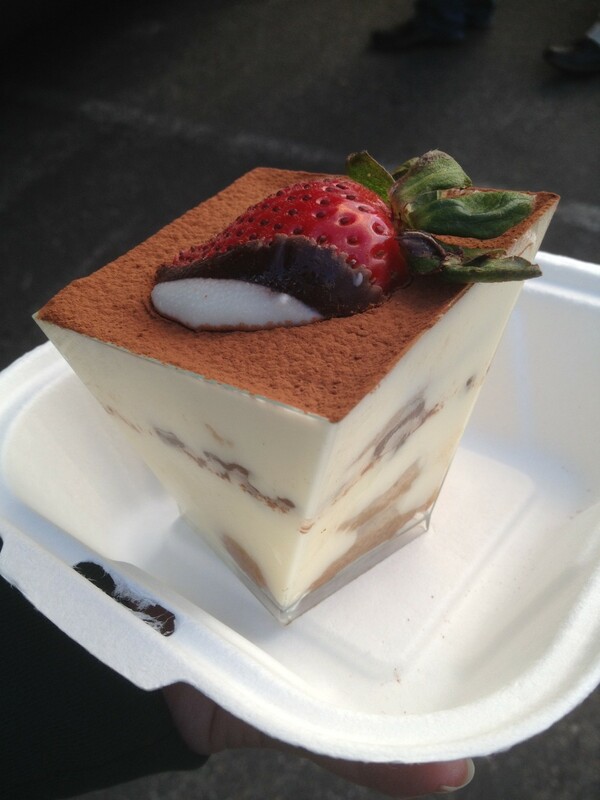 Dessert Truck. 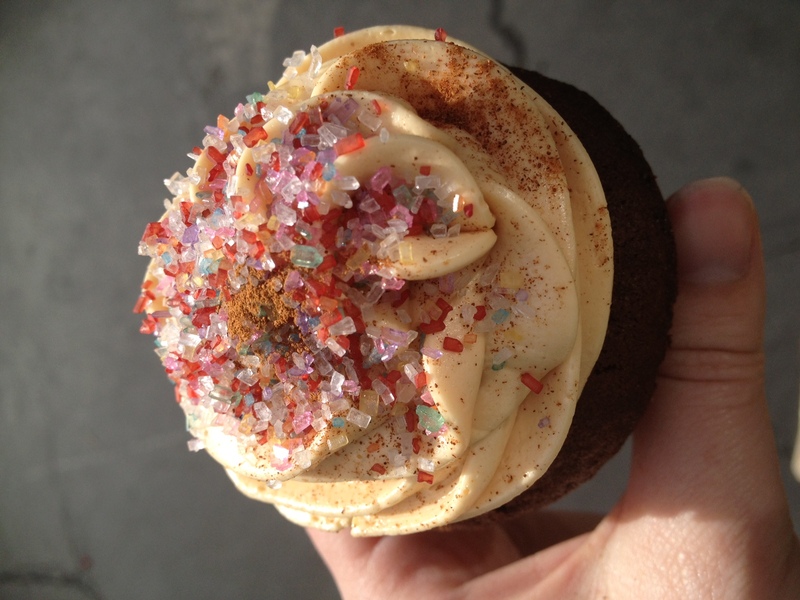 I had gotten cupcakes from them once before about a month ago at Newark Street Eats. This is why I was surprised when the gentleman manning the truck recognized me as a returning customer. Impressive! 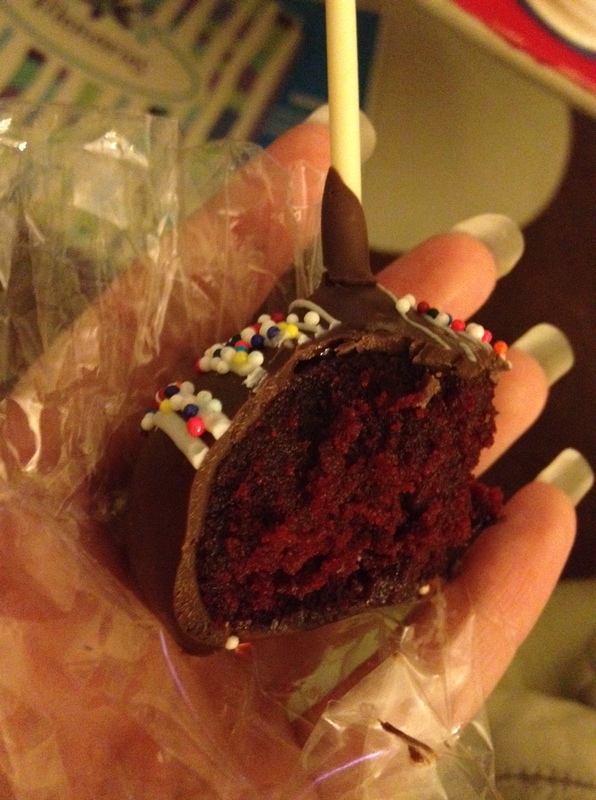 I got a red velvet and a salted caramel. 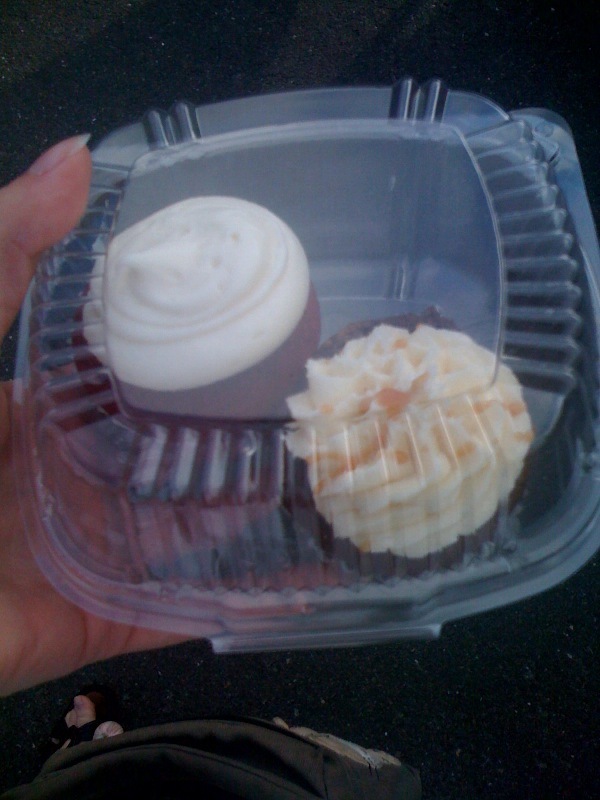 Red velvet and salted caramel cupcakes from That's Sweet! The next two trucks I hit up, for both my mom’s and my meals were two old favorites, House of Siam on Wheels and BBQ Kalbi. I got a tofu taco from each. Tonight was my last Moveable Feast in San Jose for about a month 😦 I didn’t take many photos because I spent some time chatting with Food Truck Nerd and his wife. 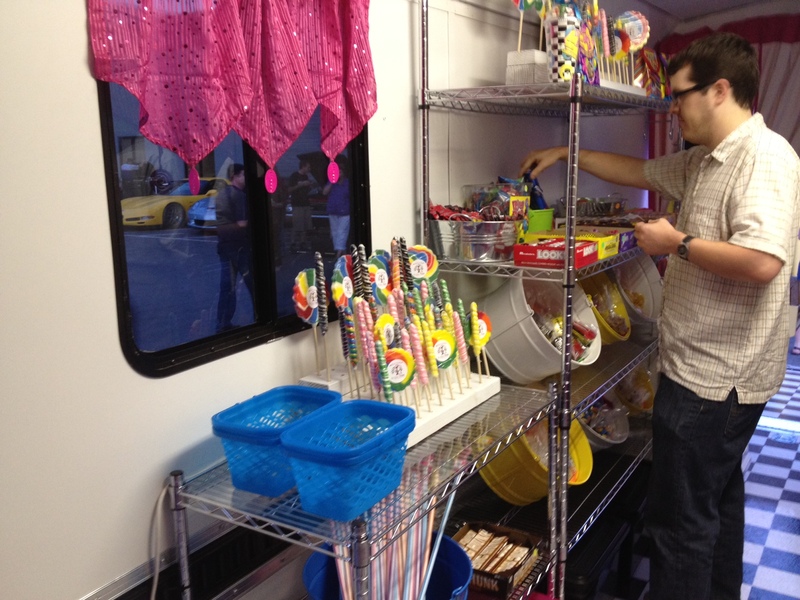 They also introduced me to Ryan, the owner of Treatbot and creator of Moveable Feast. 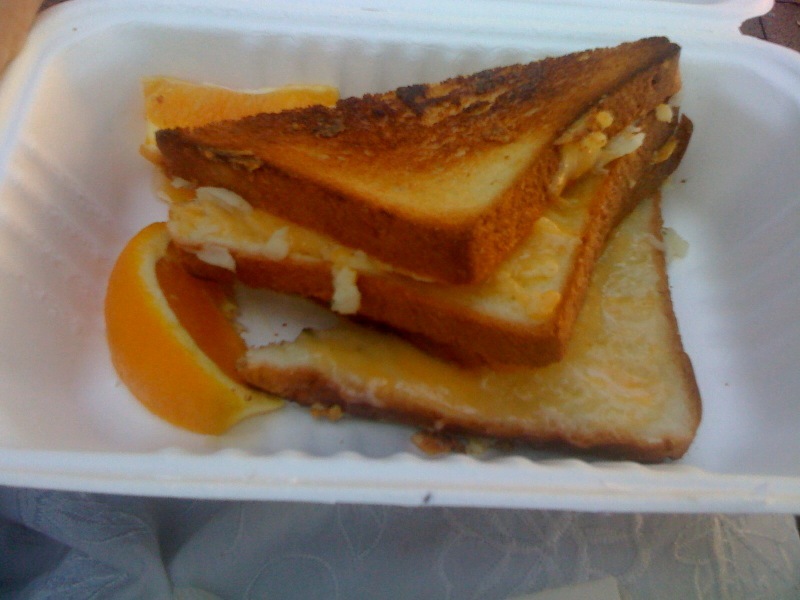 When I arrived I made a beeline straight to the line for Toasty Melts, a San Francisco based truck that doesn’t make it to these parts very often. 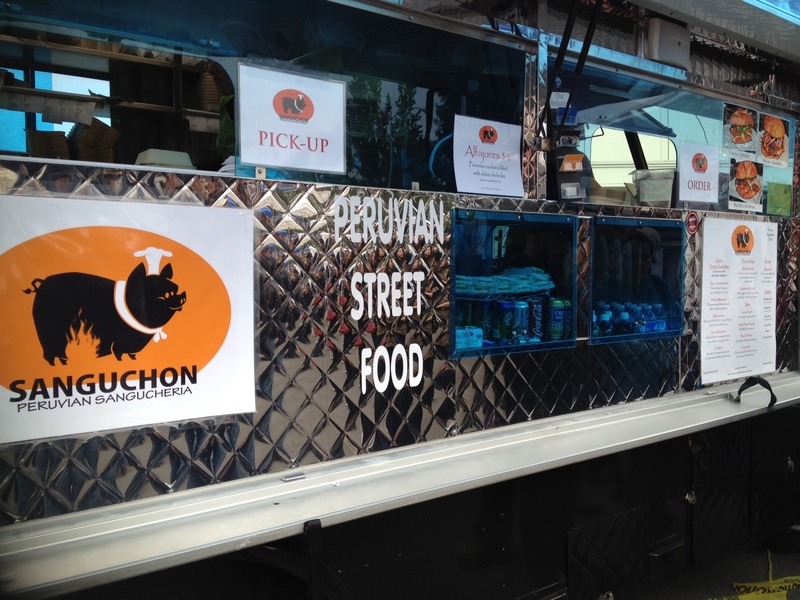 I had had food from their truck once before and had been waiting to try more. 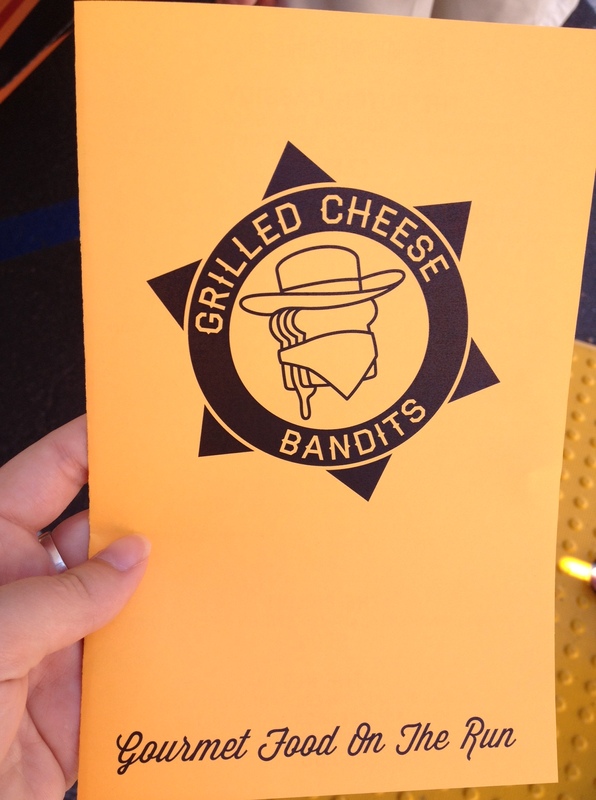 I got an Irish Cheddar Bomb, which consisted of two types of cheddar cheese and garlic mashed potatoes. Being lactose intolerant, I had to double up on the lactaid, but it was totally worth it. I wanted some Treatbot afterward but thought I should cool it on the dairy, so I got a cup of their lemon sorbet flavor. 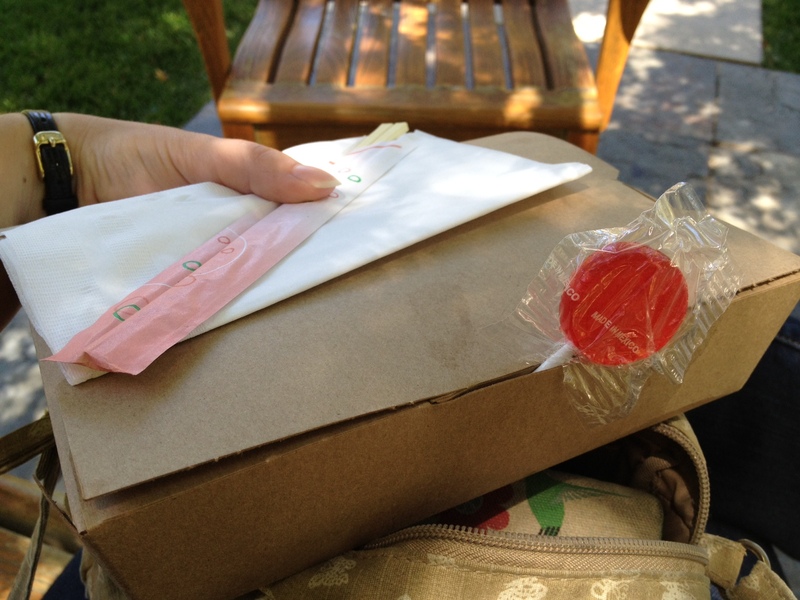 It was perfectly refreshing and fun to snack on while chatting. Phew! What a week. I’m gonna miss my regular truck gatherings while I’m out of town, but that will make them seem that much better when I come back, right? 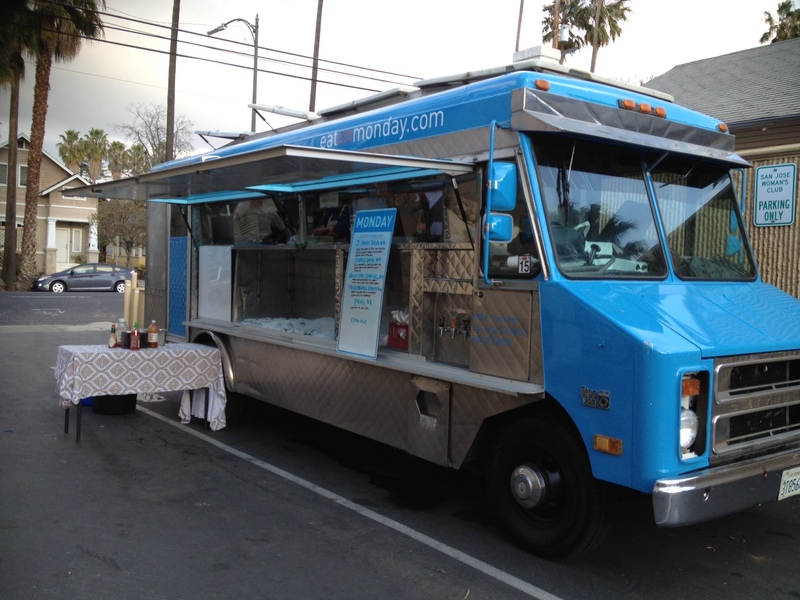 On Thursday, July 7th Moveable Feast held an event outside of their usual Saturday in San Pedro Square time and location. 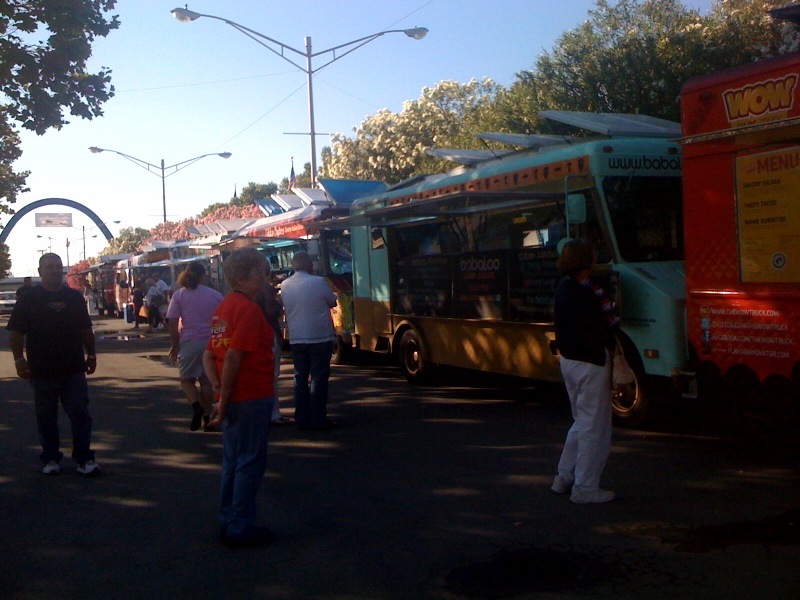 Seven trucks joined the rest of the Hot San Jose Nights festivities at the county fairgrounds for the evening. I’ve found that my food truck obsession has brought me to places and events that I never would have seen otherwise on many occasions. This was definitely the case on Thursday. Old fashioned cars lined the perimeter of the event and often drove right by while I enjoyed my meal. There were also a lot of people dressed in poodle skirts and other ’50s garb who were attending the sock hop and decided to stop by for some dinner. 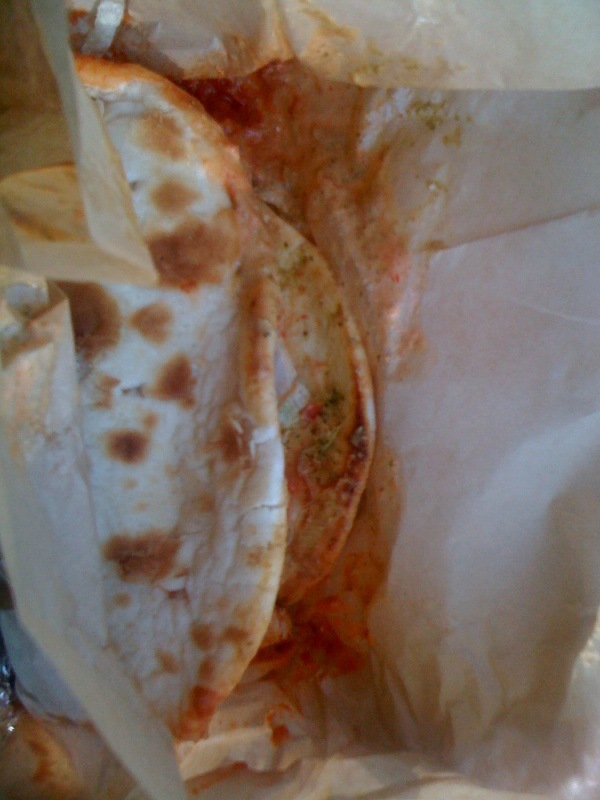 Despite not photographing well and requiring multiple napkins to enjoy it, the naanwich was full of flavor and very filling. 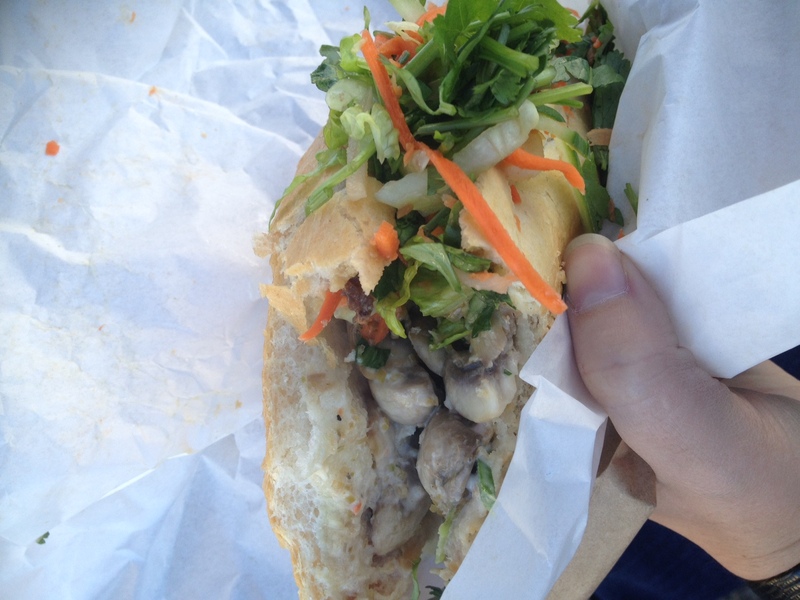 I had been eyeing a sandwich at another truck for afterward but soon realized I was too full for anything that big. Instead, I made my way over to The Wow Truck, a truck I never thought I’d eat at again because of their lack of vegetarian options. They have started serving a vegetarian dessert option, though, called a turon. 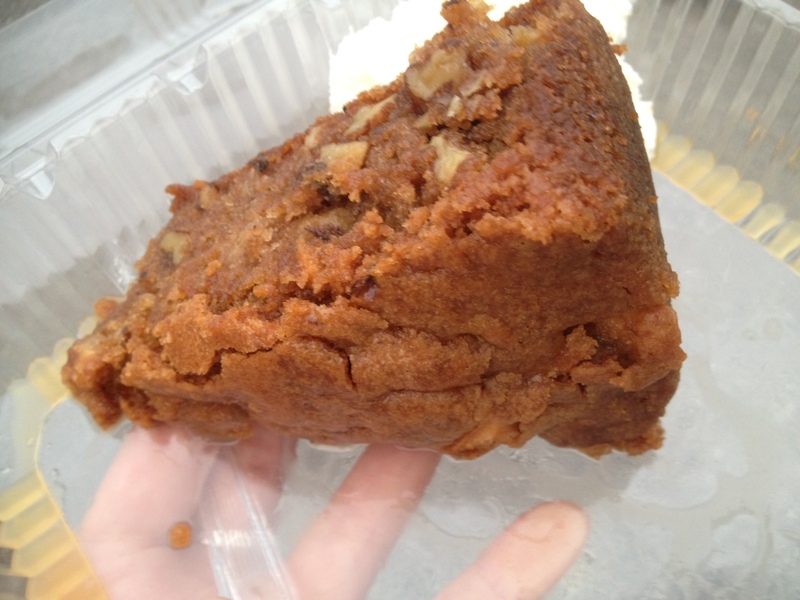 This was basically a banana fritter, and it was tasty. 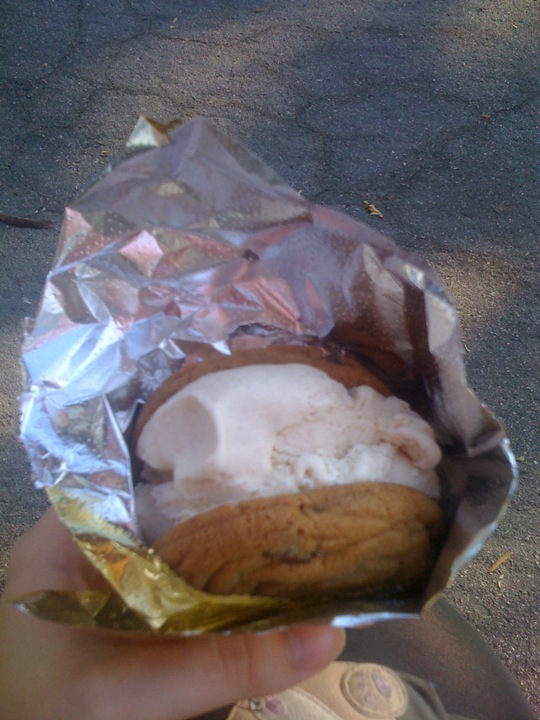 My final stop was Treatbot, where I got a chocolate chip cookie with eastside horchata ice cream. It was delicious, as always. After I finished another messy treat (the messier it is, the yummier it is, right? 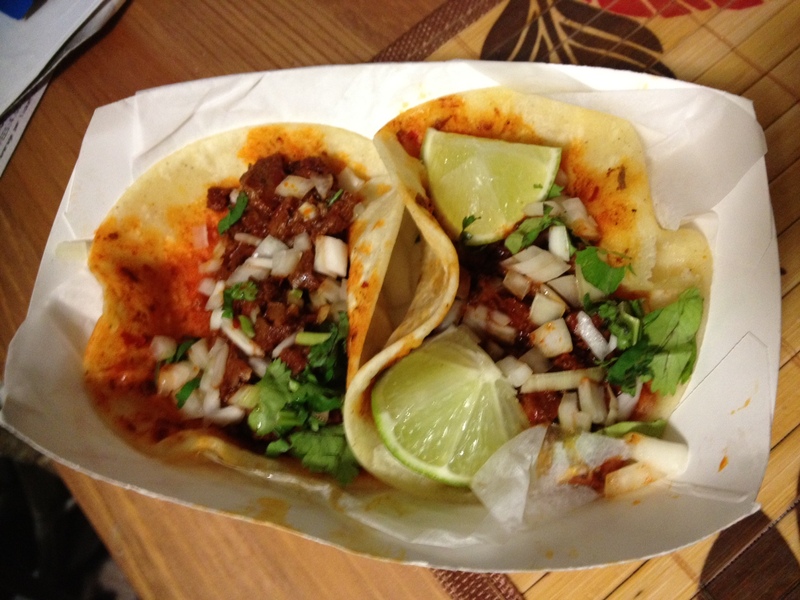 ), I met up with Food Truck Nerd for an interview for his podcast. He managed to record me between all the old fashioned cars driving by, and it was fun chatting with a fellow food truck lover. I’ll post as soon as he posts the episode with me in it, but until then I recommend listening to his previous episodes! 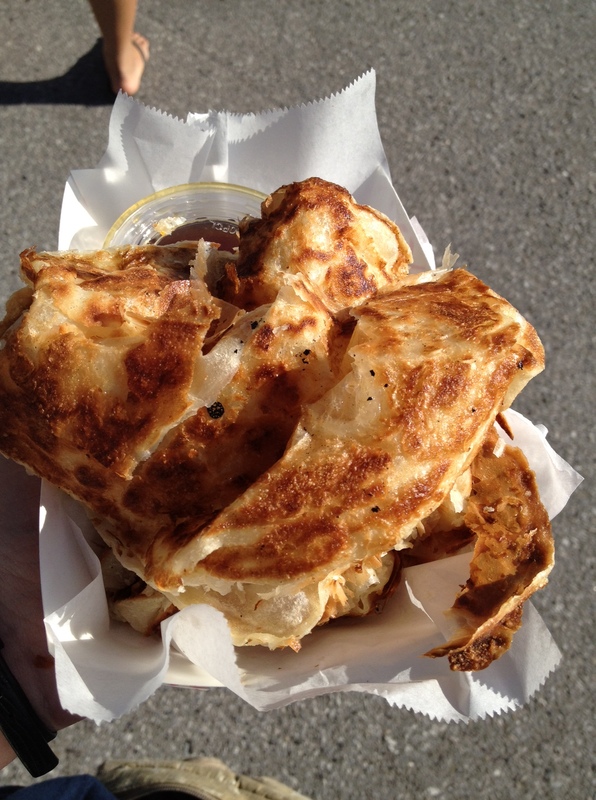 Tonight I’m heading to Edgewood Eats. I didn’t go last week, so I almost feel like I’m having withdrawals. Lots of my favorite trucks will be there, so I’m looking forward to it!